Inside, the cozy atmosphere is awash in a maroon color palette with soaring beamed ceilings, industrial pipes and light fixtures, and plenty of rooms between tables so that you are not in the laps of fellow diners. Oddly, some tables had cloths, such as ours, while many others were bare wood. Love is in the air—at least love of good food that is! 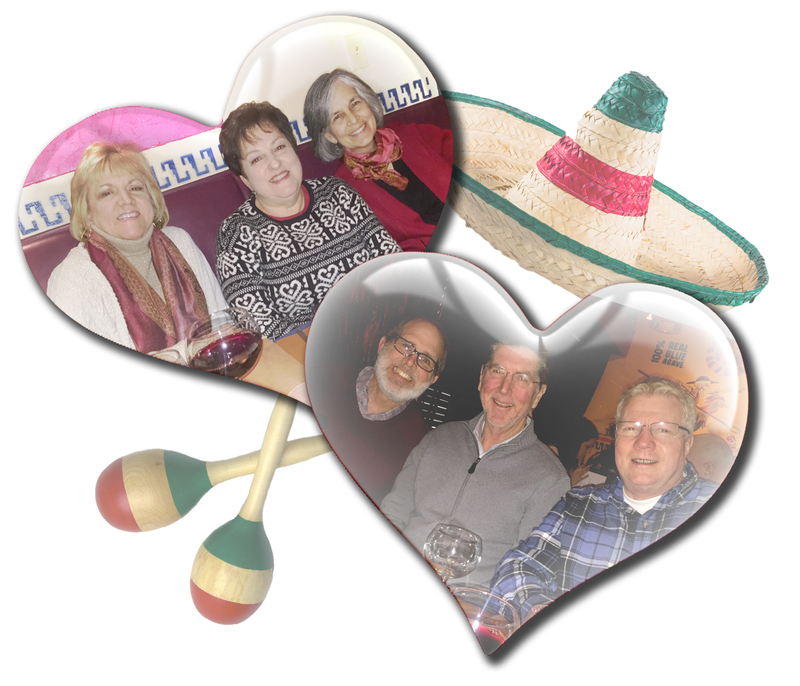 Valentine’s Day found the Ethnic Dining Group trekking to Los Sarapes for authentic Mexican cuisine. Driving over, Russ thought we had dined here many years ago with other friends, and once we pulled into the parking lot I realized he was correct. Not much to look at from the exterior, this tiny restaurant is tucked into a mini strip mall nestled between a Chinese restaurant and a pizzeria. But we knew from reading reviews and our own past experience, this was going to be a foodie’s dream! The colorful vestibule welcomes(??) you as you enter. 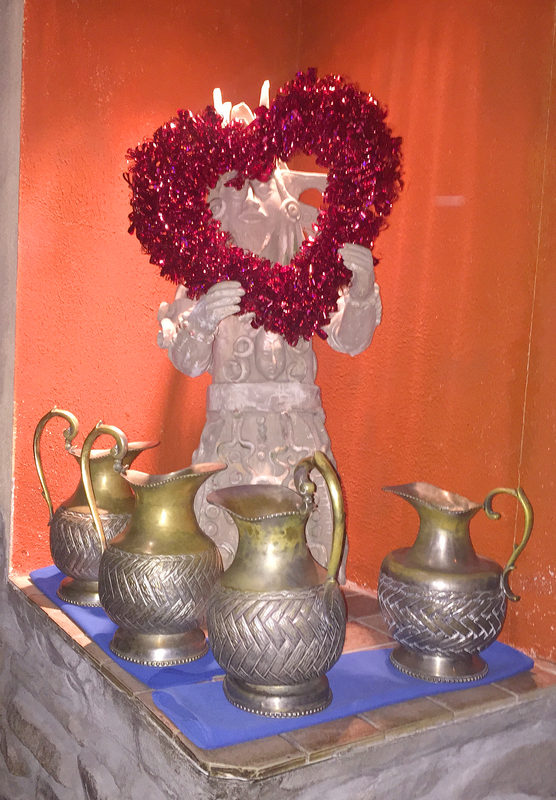 A Mexican statue holding up a heart to celebrate the holiday. 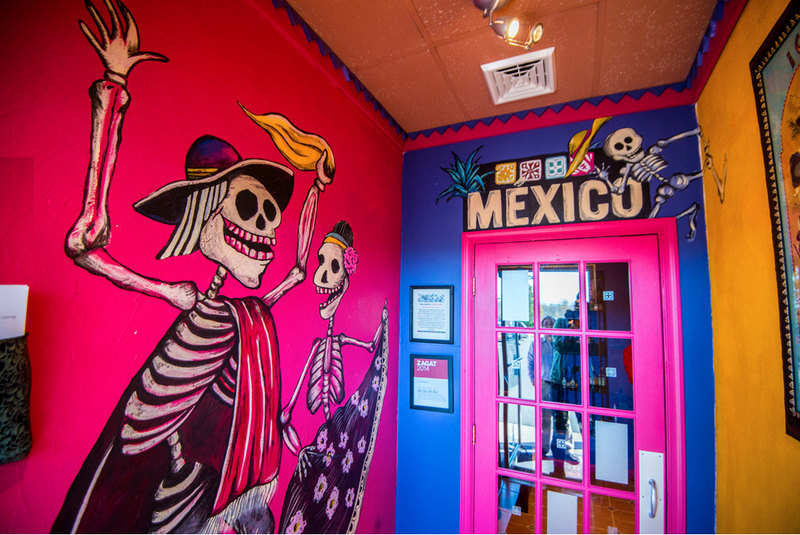 Walking in, you are visually assaulted—in a good way—with vivid colors, paintings and Mexican artifacts every where you look. The vibrant vestibule opens directly to the hostess’ stand who informed us our reservations were not until 6:30. We thought we were only 15 minutes early, turns out we had 45 minutes to kill before the rest of the gang would arrive, so we saddled up to the quaint little bar and ordered the night’s special: Blood Orange Margaritas. I’ve mentioned my penchant for anything blood orange in a previous blog or two, so let me tell ya, these libations were impressive—albeit expensive. 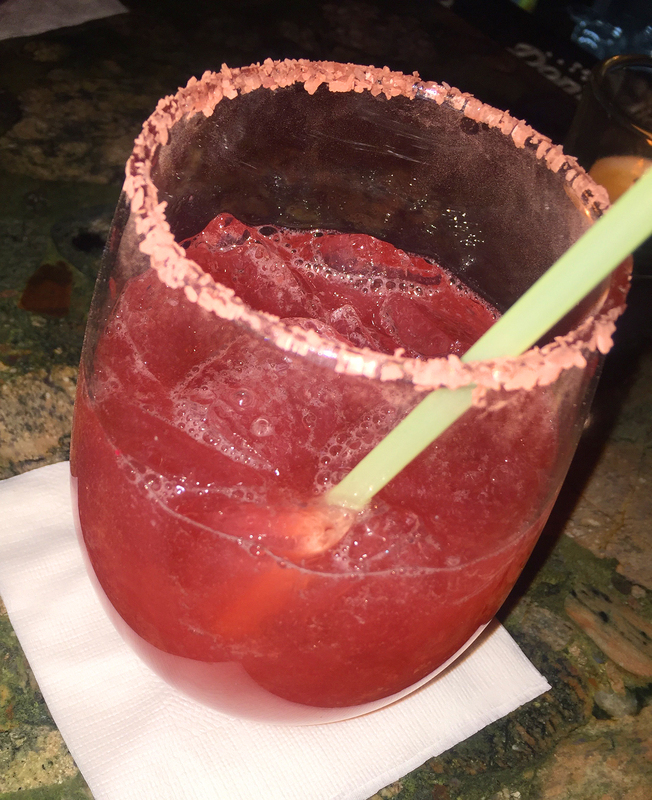 Blood Orange Margarita, the night’s house special libation. Los Sarapes means something that covers you and makes you feel warm such as a blanket, shawl, or poncho. We believe the name symbolizes us inviting you into our house (restaurant) and making you feel as warm and comfortable as you do in your own home. Their margarita and tequila bar is full-service offering over 65 tequilas, a variety of wines, Mexican and domestic beers, liquors and mixed drinks. But on Sundays they allow patrons to bring their own wine, which is exactly what we all did. Right on schedule, the other four arrived together and we were immediately seated in a cozy corner. Once Teresa and Maria Odilia found out what we were drinking, they both decided then and there they wanted one too. 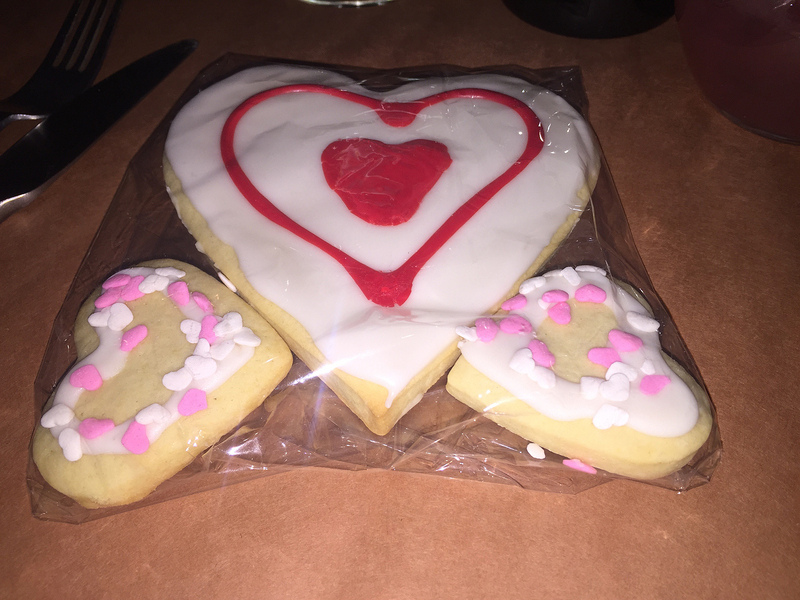 And for each couple, a special treat from Teresa, her homemade Valentine heart cookies. How sweet indeed! 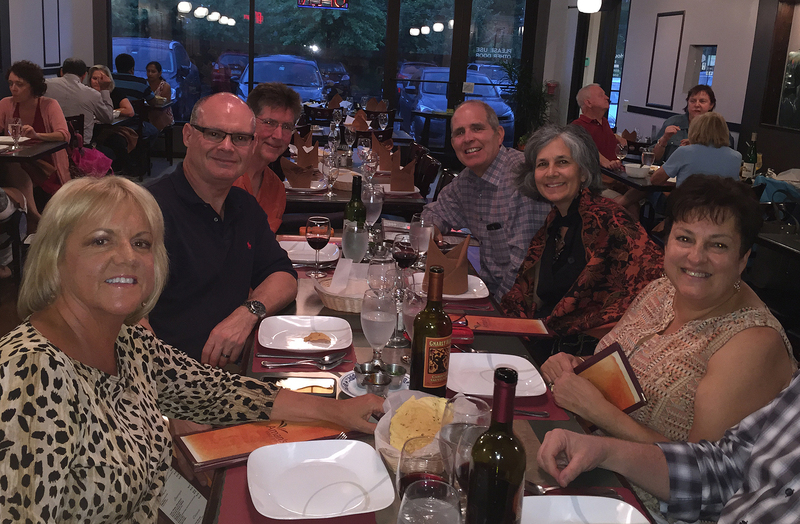 Clockwise from left: Yours Truly, Teresa, Maria Odilia, Steve, Joe and Russ. Our MO for these gatherings tends toward family-style, ordering a variety of dishes and sharing amongst the group. 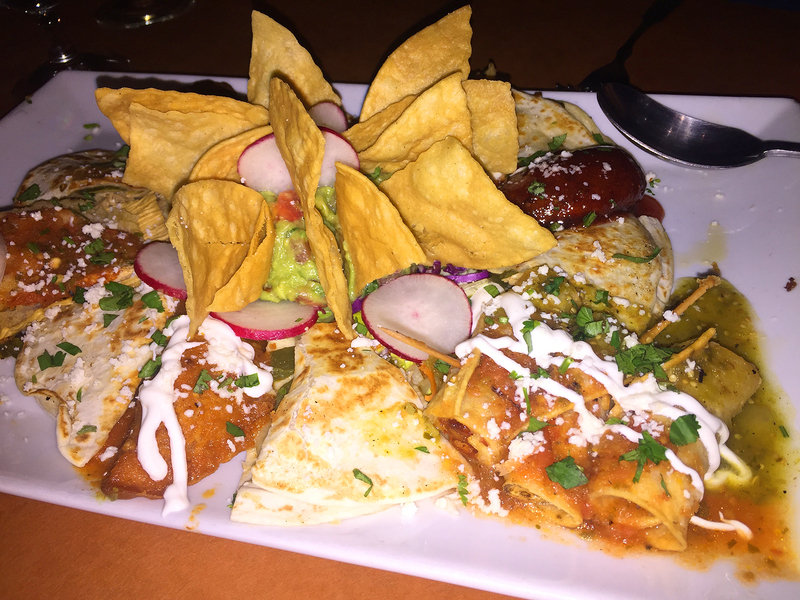 Pondering which entrees to choose, we put in an order for their Planton de Botanas—a sampling of appetizers perfect for sharing. A small order serves 4-6, and a large 7-10. Included in the mix were stuffed jalapeños, homemade corn tortilla chips with a fabulous guacamole, empanadas and Banderillas Ahogadas—one of Los Sarapes’ favorite creations, small rolled, crispy corn taquitos filled with shredded chicken, topped with sour cream, hot sauce, queso fresco and cilantro. The appetizer platter, Planton de Botanas. 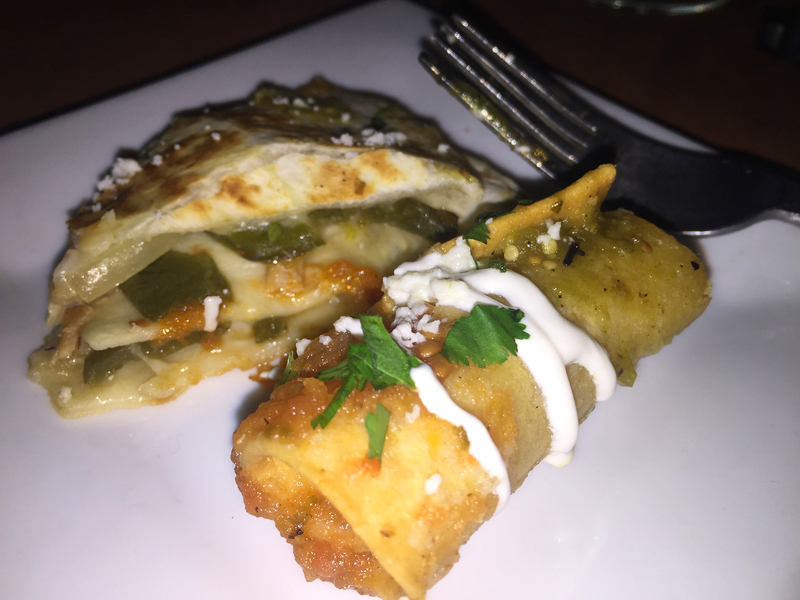 A close-up of an empanada and taquito from the appetizer platter. Now came the agonizing decision of what main courses to order. Upon hearing that Paella (pictured directly below) was a special of the evening, we requested two without hesitation. 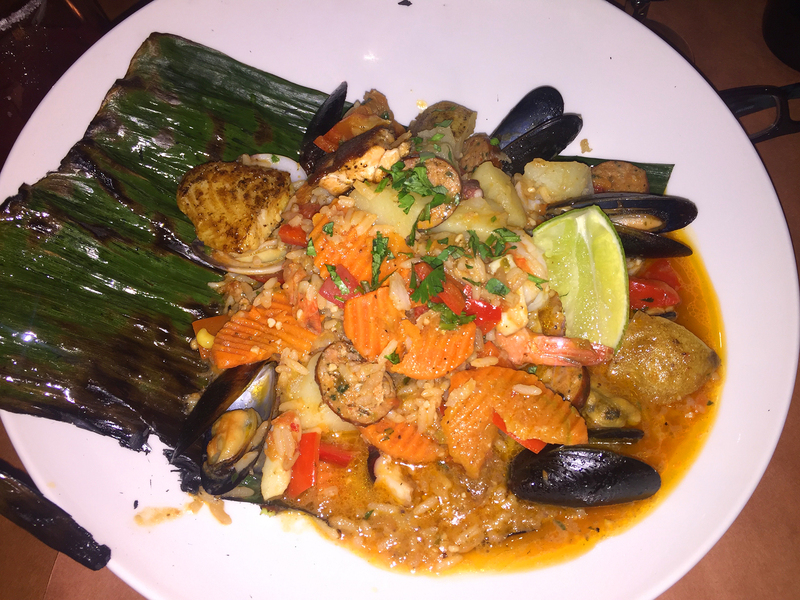 Not only were the paellas strikingly plated on banana leaves, they were phenomenal tasting, composed of everything from chicken, shrimp, mussels, fish and sausage, to assorted colorful vegetables over a flavorful broth and rice. 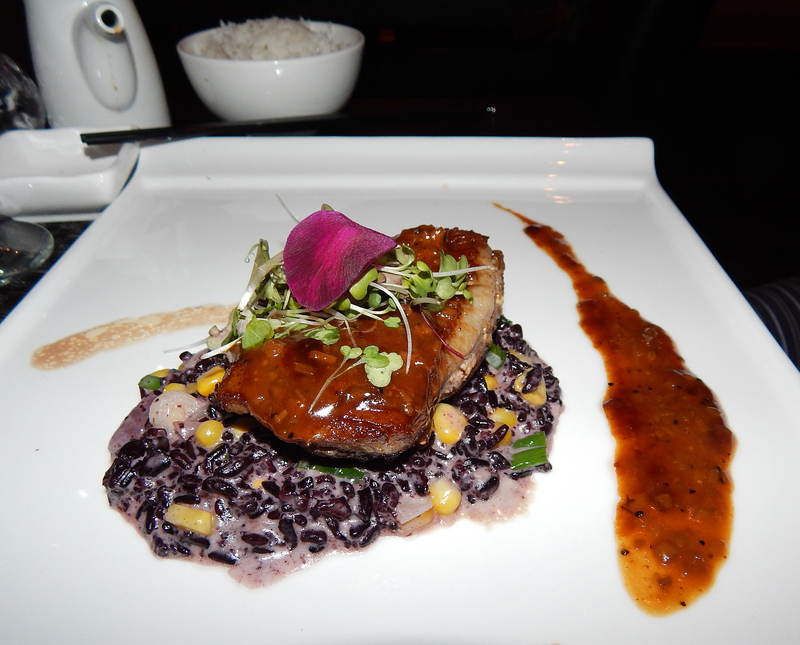 My suggestion was the Pescado Criollo—steamed grouper fillet stuffed with seasoned baby shrimp and crabmeat, topped with a chipotle cream sauce, and served atop a black bean pureé, with a colorful tower of rice served on the side. 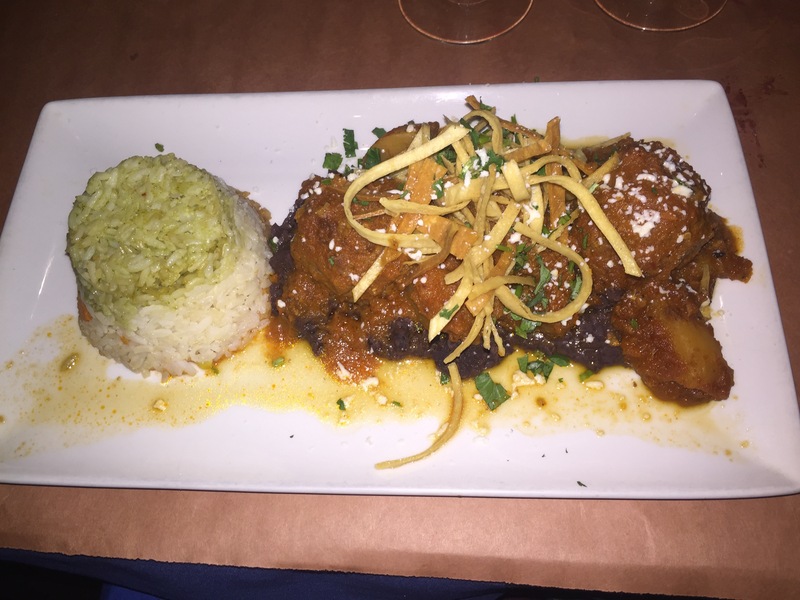 Another choice produced Albondigas al Chipotle—delicious meatballs of mixed ground meats with a cheese center, simmered in smokey, spicy chipotle-chorizo sauce, served over refried black beans with rice on the side and garnished with cilantro and corn tortilla strips. 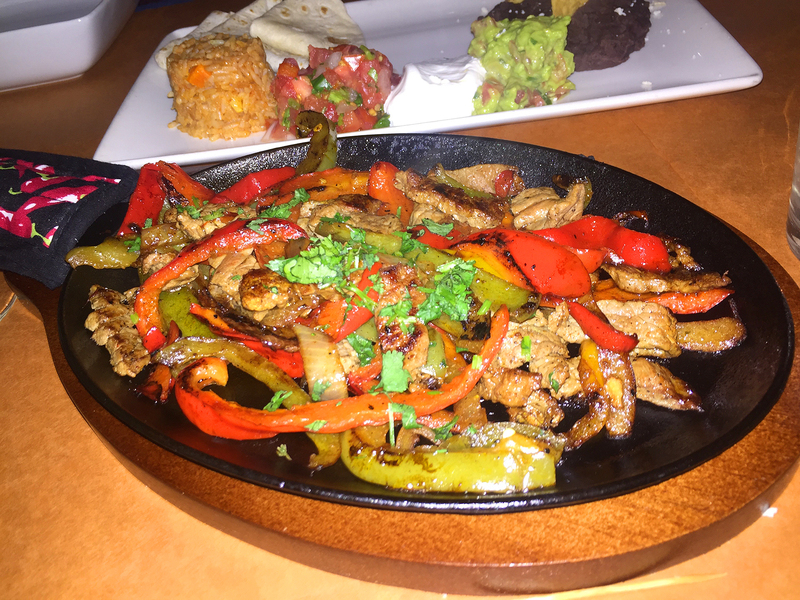 Steve was eager for Fajitas Horsham—a vivid skillet of onions and pimiento morrón peppers pan seared with steak (or a choice of chicken, combo or vegetarian style), served with rice, refried black beans, guacamole, sour cream and pico d’gallo, and accompanied with flour tortillas. 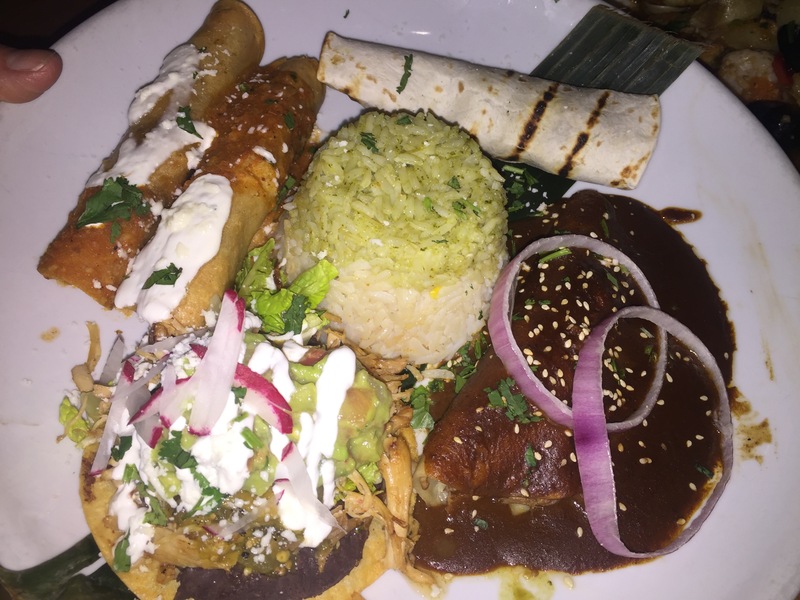 And the final selection was Plato Mixto—two crispy taquitos stuffed with chorizo and potatoes, shredded beef enmolada, tostadita with shredded chicken, bean and cheese taco, served with flag rice: three bands of rice—red, white, and green arranged to mimic the colors of the Mexican flag. Everyone’s appetites were in full-gear because surprisingly there was very little leftover! Some even had room for dessert, so an order of traditional Flan and Flan-topped Strawberry Cake were shared by those who wanted to end the meal on a sweet note. The dessert Flan was a winner according to those who indulged. 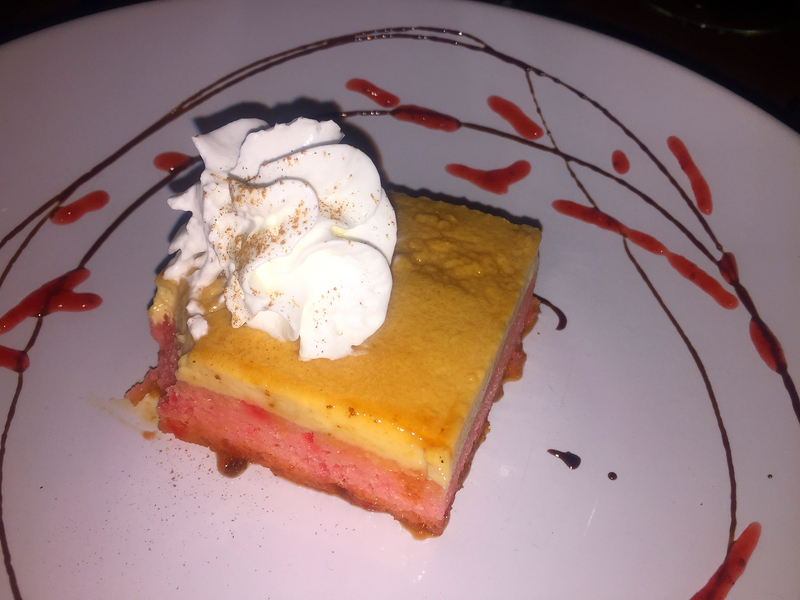 Artfully plated Flan-topped Strawberry Cake was shared by a few. 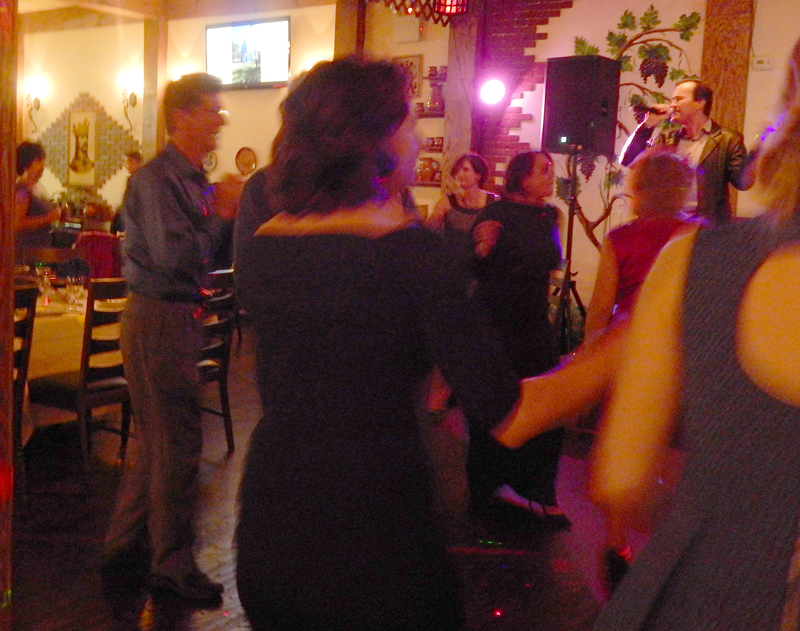 Olga and Carlos Marin, and the rest of their family, opened the doors of Los Sarapes in Chalfont over twenty-two years ago. Over the years they have grown to offer their cuisine in Blue Bell, Horsham, Wayne, and Massachusetts. The Horsham location is conveniently located in the Horsham Center Square with plenty of parking. Maria Odilia and Teresa review our appetizer choices with the waiter. 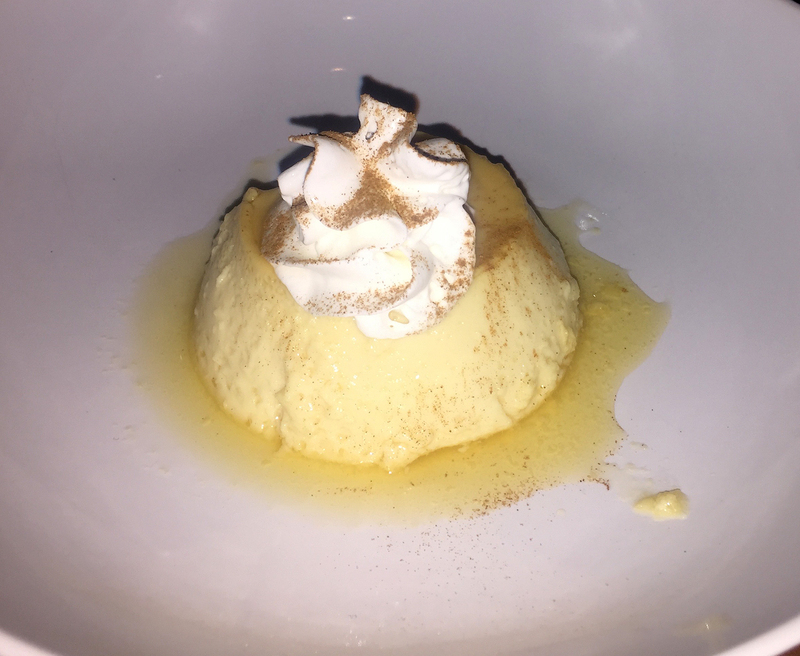 I previewed the plethora of online reviews before our journey and could only find high accolades for the food! One minor drawback, the fact that it was in a strip mall and the view from the large front window was of the parking lot. But since none of us were situated with an immediate view out front, it didn’t deter from our enjoyable evening. After greeting each other with hugs, and while catching up on the latest family news, we set about the task of choosing starter dishes that encompassed the scope of their offerings and everyone’s individual preferences. 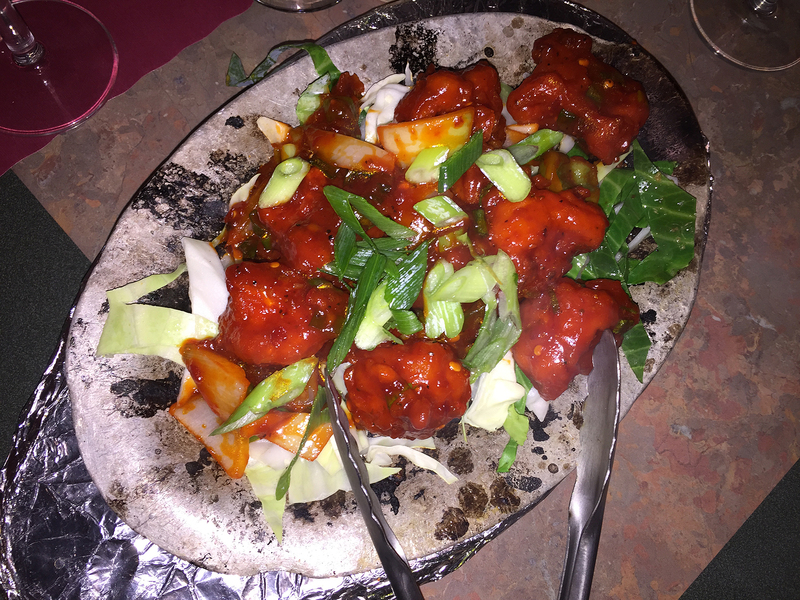 The very popular Gobi Manchurian appetizer. 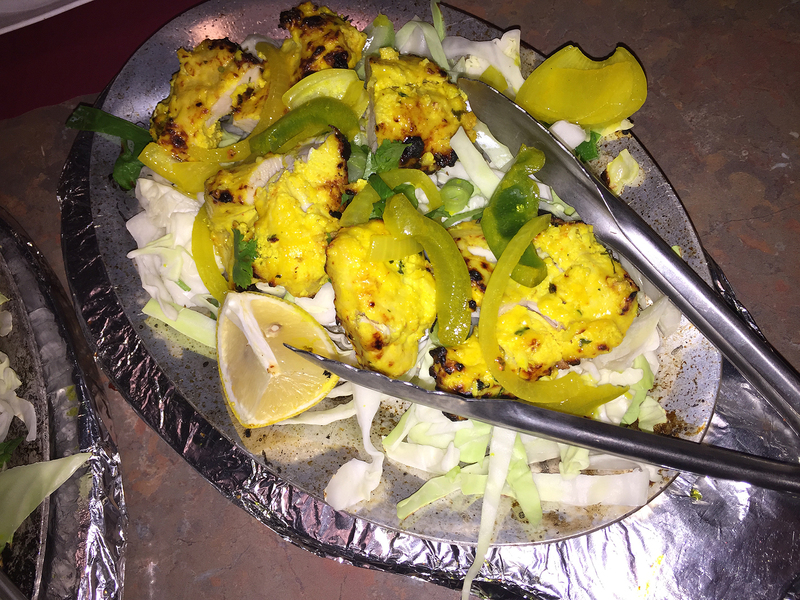 Another winner was the Chicken Lashuni Kabab. 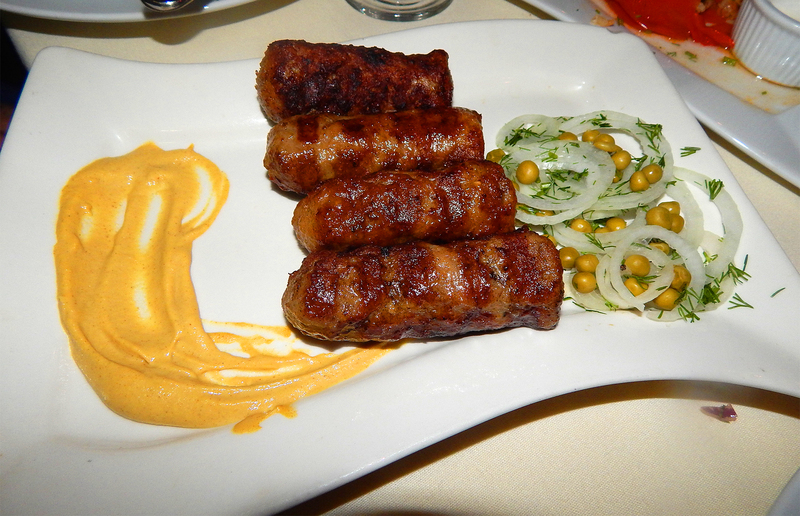 The Seekh Kabab made with ground lamb. 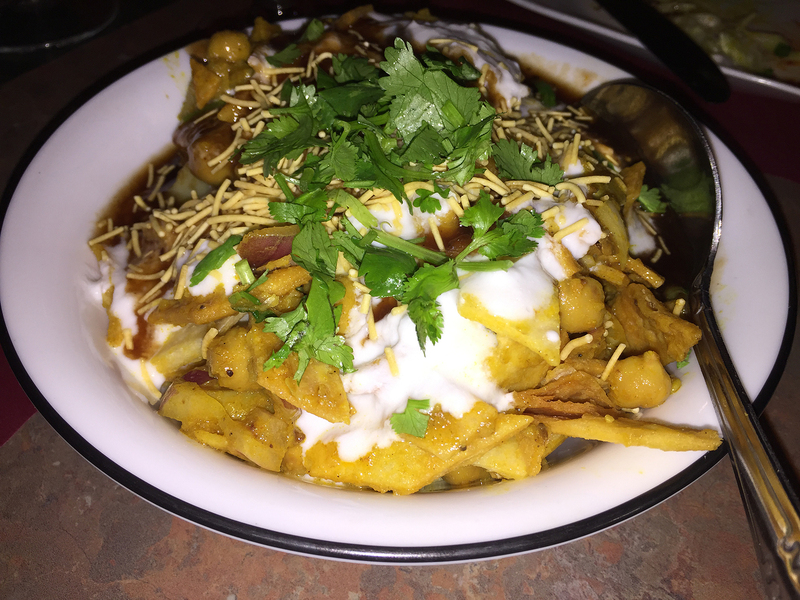 While some of the group loved the Papri Chat, others found it too sweet. Although Aman offers a buffet, we chose to pick from the extensive menu. The initial choices boiled down to four appetizers to share family-style. First up and the favorite among many was GOBI MANCHURIAN (DRY)—Cauliflower stir fried with a sweet and tangy Indo-chinese sauce. It was so, sooo good! Other starters included the SEEKH KABAB—Ground lamb with onions and fresh herbs roasted in a clay oven, tasty but the meat was a bit dry; a decidedly popular CHICKEN LASHUNI KABAB—Boneless chicken marinated in garlic, herbs and spices and grilled in a clay oven; and finally the PAPRI CHAAT—Seasoned potatoes and vegetables with crisp wafers tossed in yogurt, topped with tamarind sauce—while some loved this dish, Russ and I felt is was a bit too sweet for our tastes. Two orders of Lamb Khadai. 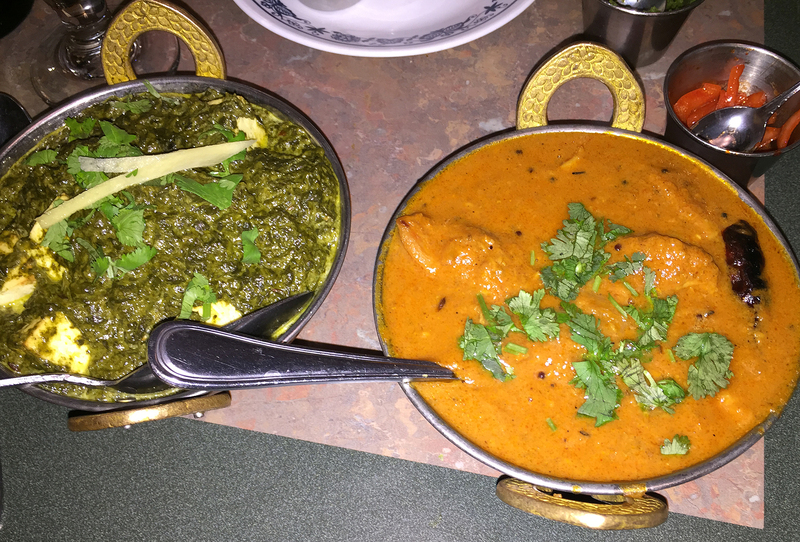 Saag Paneer, a spinach side dish and Chicken Tikki Masala. 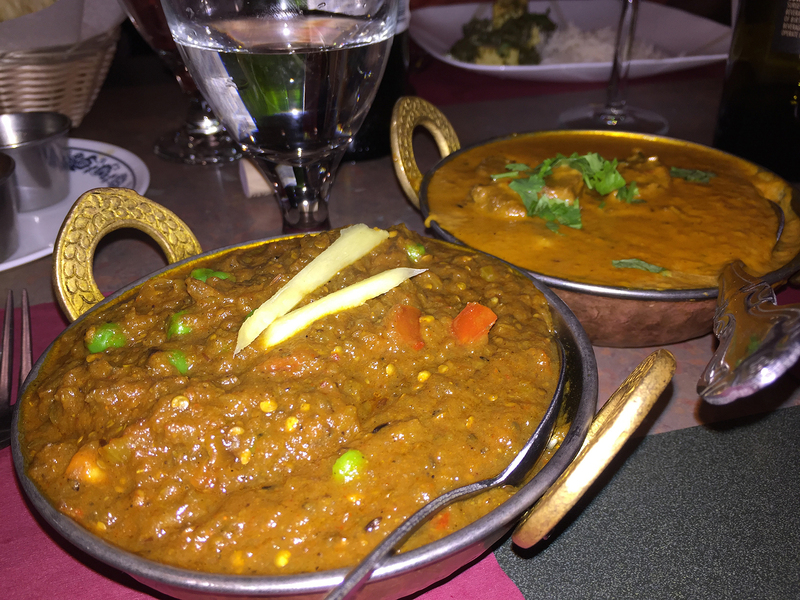 Entrees of Baingan Bharta and Lamb Korma. Nearly finished with the appetizer round, it was time to make entree picks. 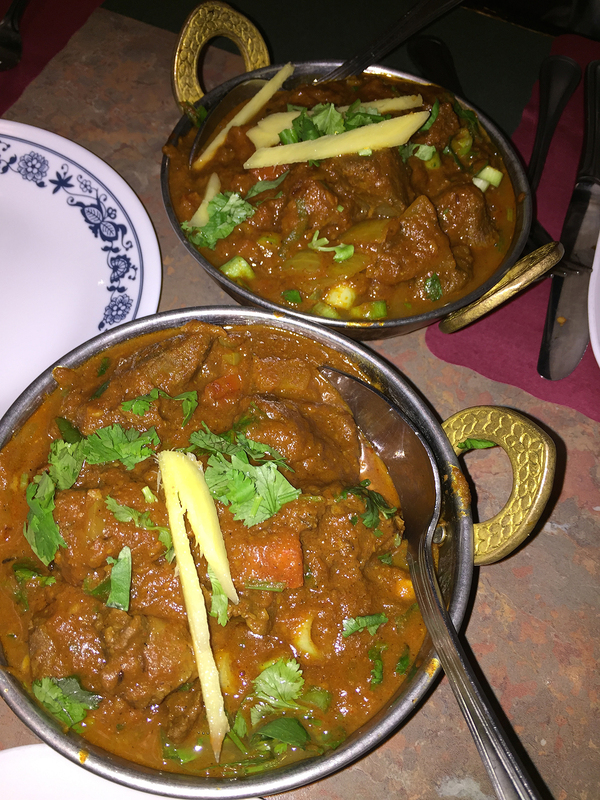 Having ordered this dish at other Indian restaurants, Russ and I both made the selection rather quickly and zeroed in on the LAMB KADHAI—Chunks of lamb sauteed with fresh ginger, tomatoes and bell peppers cooked in an Indian wok. The other choices consisted of LAMB KORMA—An exotic preparation of tender lamb, cooked in spiced creamy cashew sauce for Steve; CHICKEN TIKKA MASALA—Chicken cubes broiled in Tandoor and cooked in a mild tomato and onion cream sauce for Joe and Teresa; CHICKEN SHAHI KORMA—A royal dish, boneless chunks of chicken cooked in almond and cashew sauce, topped with dry fruits for Earle; and finally for Maria Odilia BAINGAN BHARTA—Grilled eggplant pureed and cooked with peas, tomatoes, onions and spices. 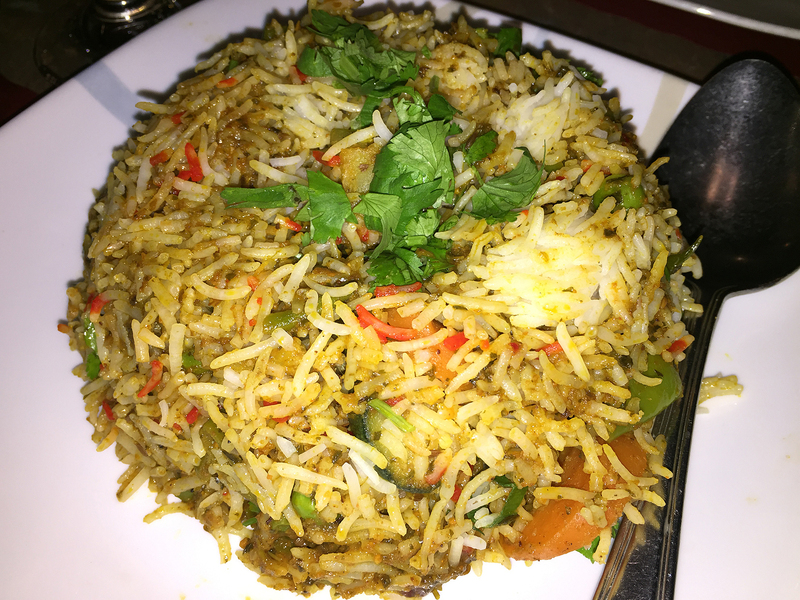 An order of Vegetable Bhiryani. Wanting to choose something from most categories, we tacked on an order of excellent VEGETARIAN BIRYANI—Basmati rice cooked with seasoned vegetables, herbs and spices; tasty GARLIC NAAN—Fresh garlic and coriander seasoned naan, both a hit with the entire group; and SAAG PANEER—Homemade cottage cheese cooked with spinach, herbs and spices. Entrees arrived in small decorative metal bowls (definitely a notch above the Corelle dinner plates), accompanied by large bowls of fragrant basmati rice. Teresa and Joe Hagan and Russ Hartman smile for the cameras. Dinner was a three-hour affair as we leisurely savored the multitude of dishes. 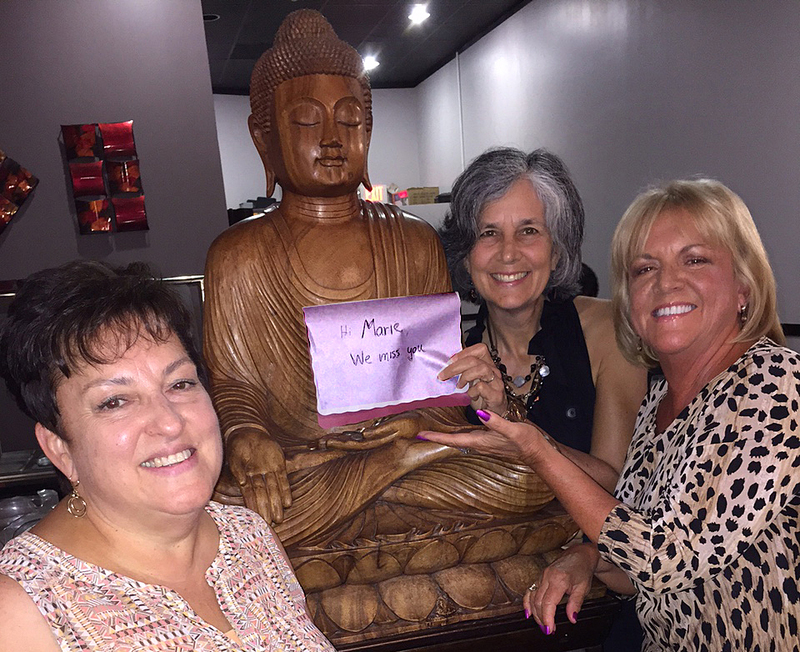 And because Earle’s wife Marie was still in Colorado, us ladies had our picture taken with Buddha, above, sporting a “Wish You Here” sign. A few contemplated dessert, but the overall consensus was we were too full to even think of it. Instead we asked the wait staff to package up the leftovers for another day. Lynn and Earle posing pre-dinner. 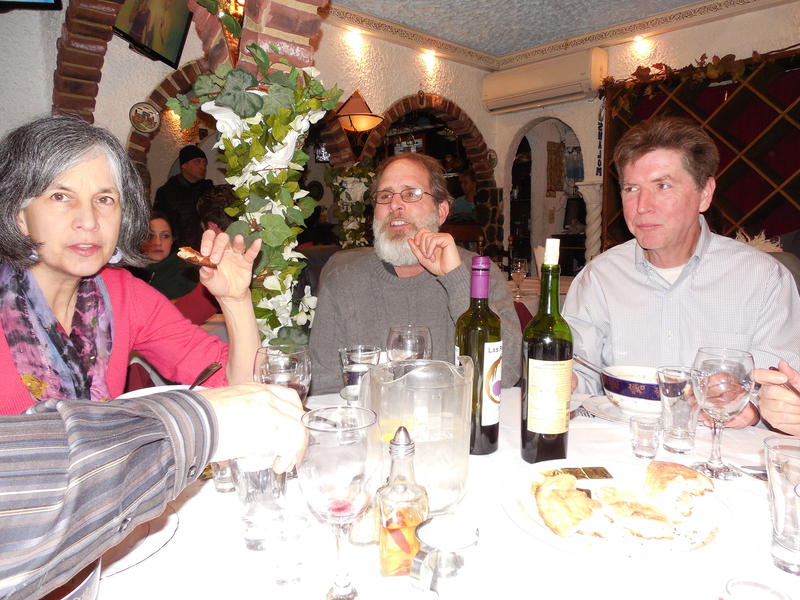 Originally thinking of patronizing an Ethiopian establishment, several group members were not thrilled with the idea of such a spicy cuisine, so Teresa suggested Greek food and took matters into her hands by making reservations for us at Zorba’s one night over the Memorial holiday weekend—and we’re glad she did! Without too much effort, we found free side street parking next to the Eastern State Penitentiary which looms large in the hood, but closed in 1971. Notorious criminals such as bank robber Willie Sutton and Al Capone were held inside its innovative wagon wheel design. At its completion, the building was the largest and most expensive public structure ever erected, and quickly became a model for more than 300 prisons worldwide. 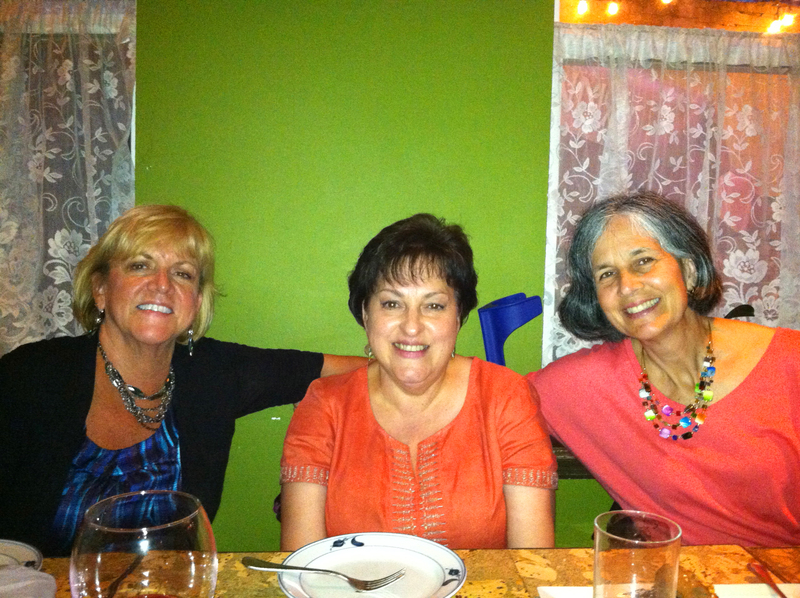 Lynn, Maria Odilia and Teresa sporting our smiles! 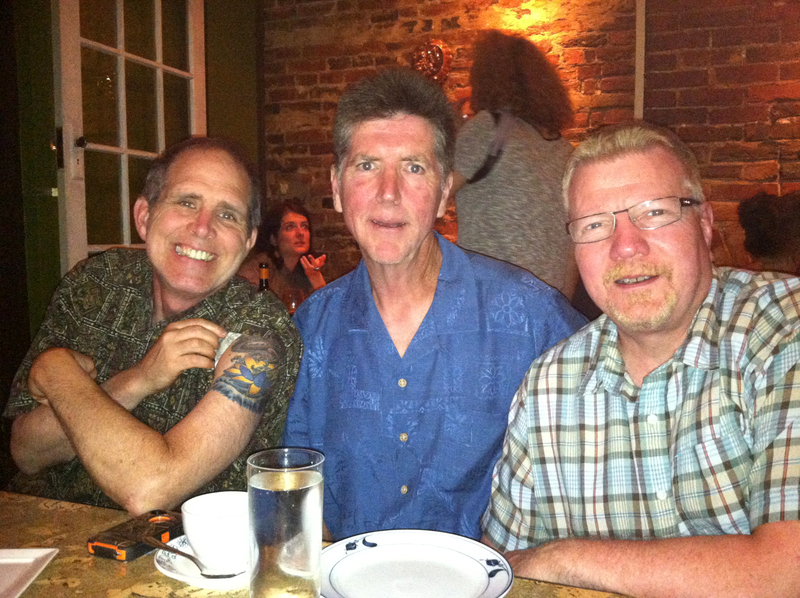 Joe, Steve and Russ getting happy. After opening bottles of wine and toasting we got down to business and selected appetizers to share: Dolmades (stuffed grape leaves) and Grilled Octopus in a balsamic reduction. Now those of you that know me well, know I do NOT eat octopus. But after one diner said it tasted like chicken I thought I’d give it one more try… and damned if it didn’t taste like chicken! I even had a few more pieces. Teresa, an octopus aficionado, wasn’t as thrilled with the dish as I was, and claimed she’s had much better elsewhere. Russ originally wanted to order the Lamb Shank entree but we were informed right up front that they were already out of that dish. 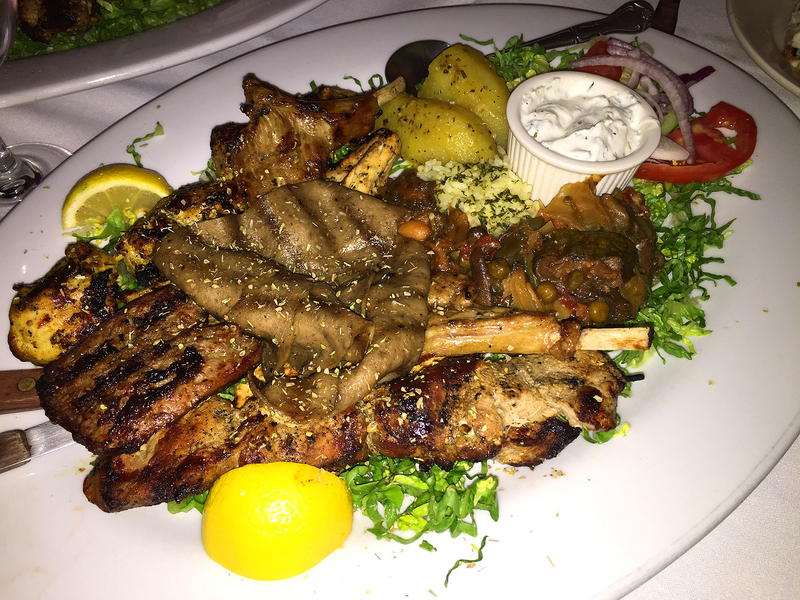 Not to be deterred, Russ and I, along with the Maria Odilia and her husband Steve, chose their infamous Charcoaled Sampler for Two consisting of Pork kabob, chicken kabob, marinated chicken breast, two rack lamb chops, homemade sausage and gyro. 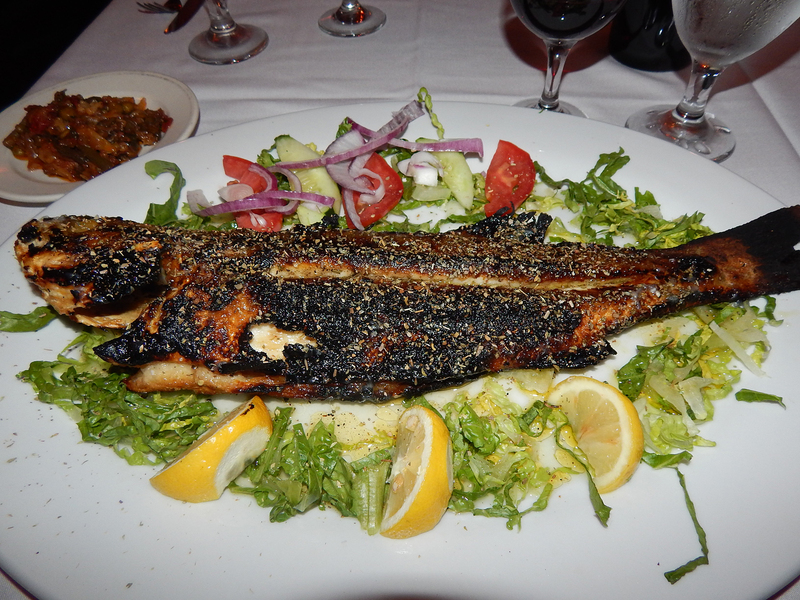 And because Teresa wanted the Chargrilled Bronzino Platter, Joe ordered the Charcoaled Sampler for One. The sampler platters were huge with just the right amount of rice, roasted potatoes and mixed veggies— so crisp and clean tasting; and although we put a herculean effort into finishing ours, we had plenty to take home. The Charcoaled Sampler Platter for Two. 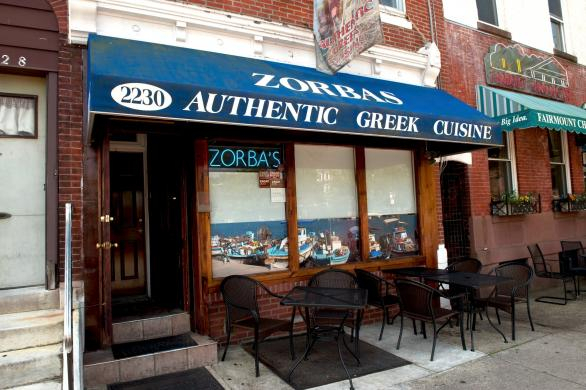 Zorba’s is small, and cozy with additional seating on the sidewalk out front or in a side alley. 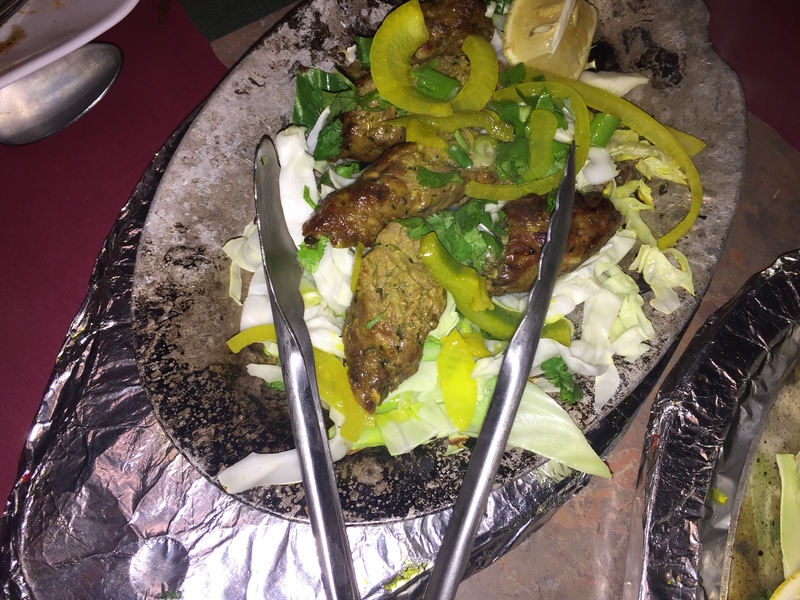 They offer cold appetizers and hot, salads, platters for lunch, pita sandwiches, vegetarian, desserts, combination platters, seafood, lamb, sautéed entrees and dishes from the charcoal grill. 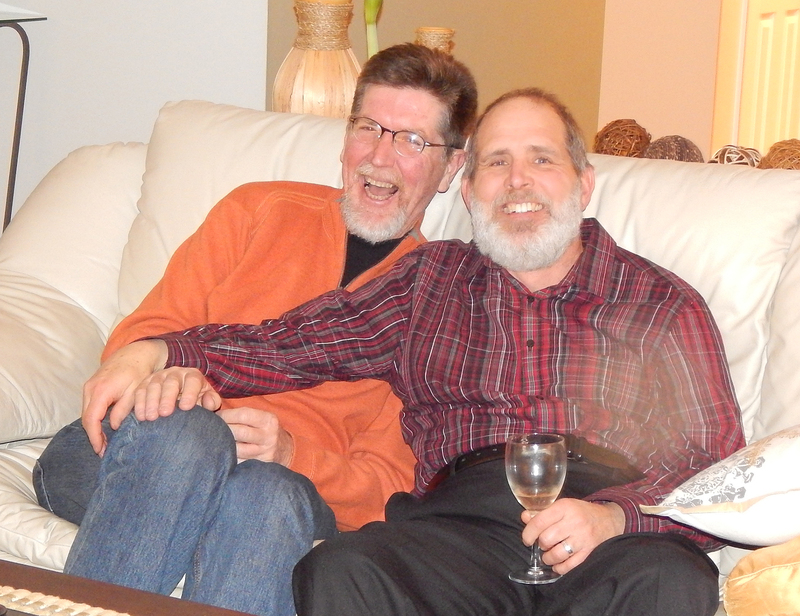 It was a great place to linger and chat—and finish the wine—long after the dinner was cleared. Plans were being discussed about a Autumn getaway weekend in upstate NY to celebrate 4 out of the 6 of us who will turn 60 later this year… OPA! 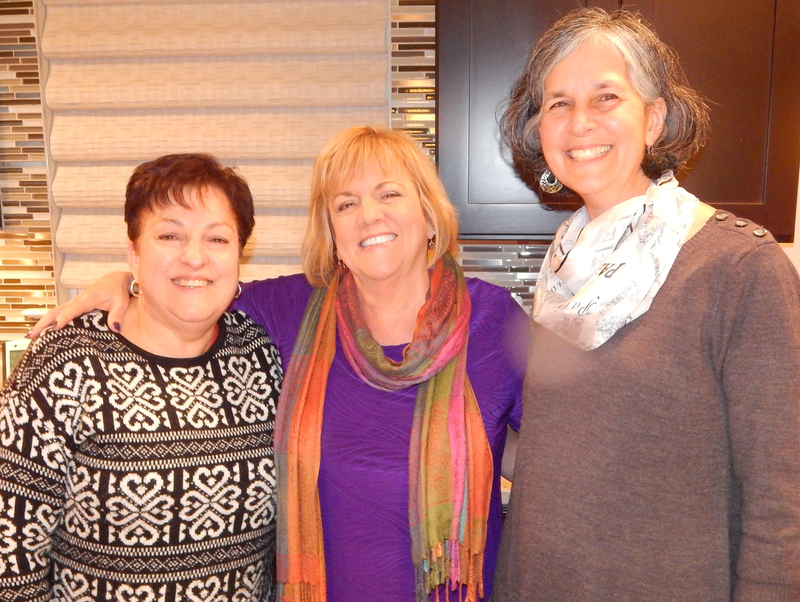 Teresa Hagan, Lynn Holl, and Maria Odilia Romeu. The last time the Ethnic Dining Group got together in November, we decided to put a different spin on the suceeding experience by cooking an ethnic meal at the Hartman/Holl abode, “Maison H.” So it came to be that on January 17, 2015, the six of us joined together to prepare, cook and dine with a French themed menu. 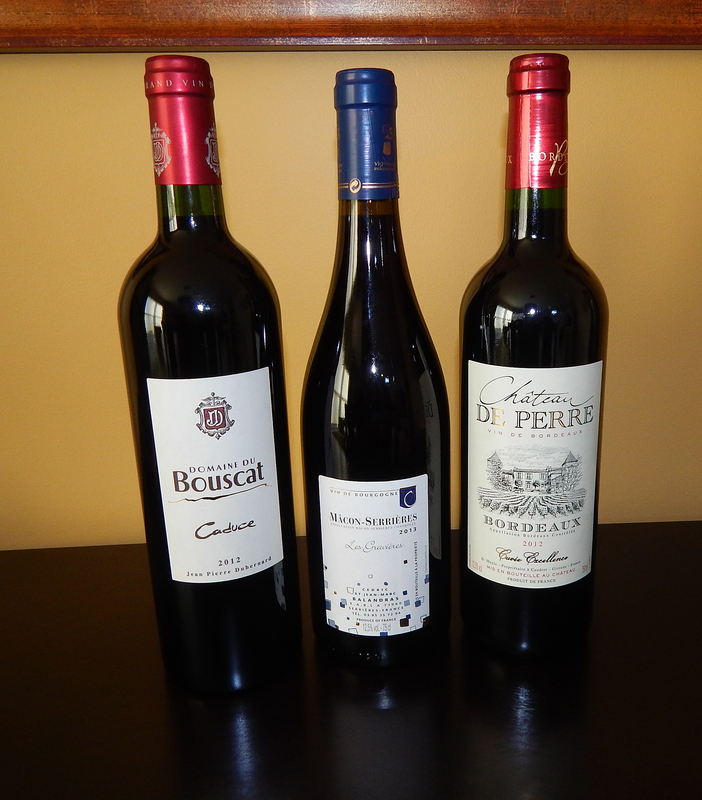 Numerous French reds, and a couple of whites added to the festivities. Teresa and Joe Hagan graciously volunteered to create the main dish, Coq au Vin; Maria Odilia and Steve Oldham contributed a fancy cheese fondue appetizer and a luscious Mousse a la Poire et Copeaux de Chocolat for dessert; while Russ and I produced some very tasty Herbed Olives, Leek and Potato Soup, Go-with-Everything Celery Root Puree, and a side dish of Endives, Apples and Grapes. What a feast! 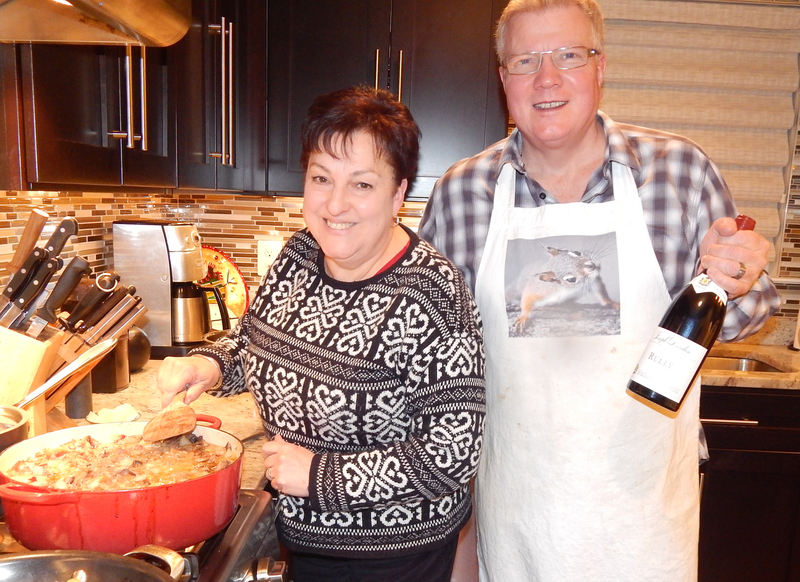 Teresa and Russ preparing the Coq au Vin. 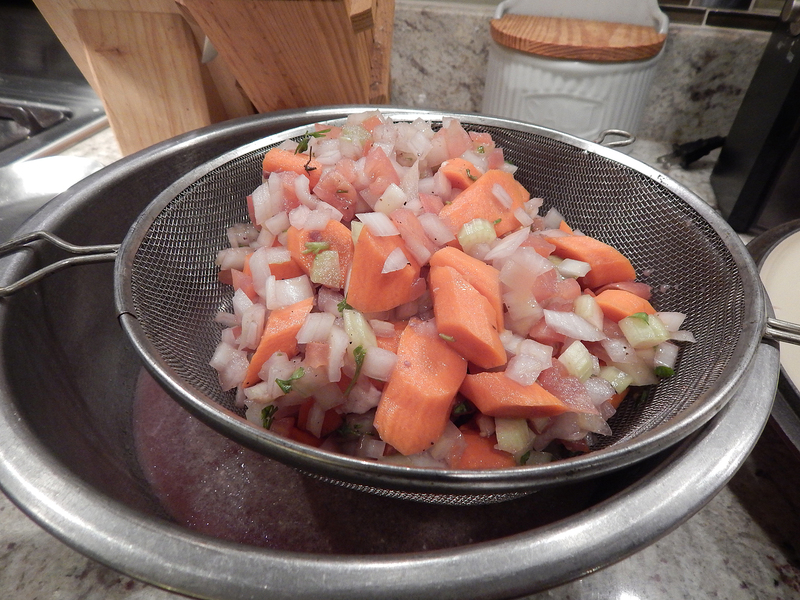 Draining the marinated vegetables for the Coq au Vin. 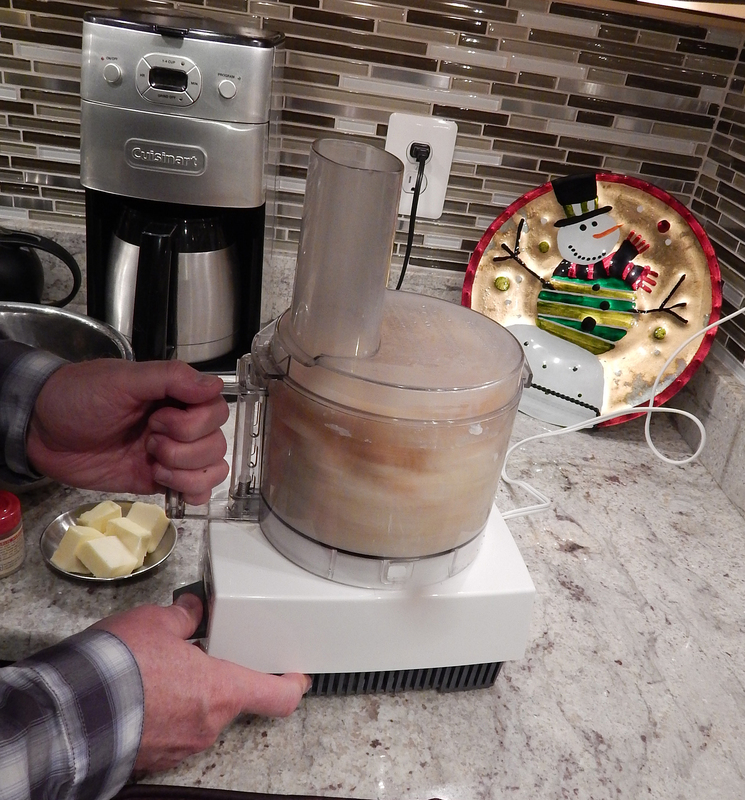 Processing the celery root for the puree. “Around My French Table” cookbook was the inspiration for many of the recipes. 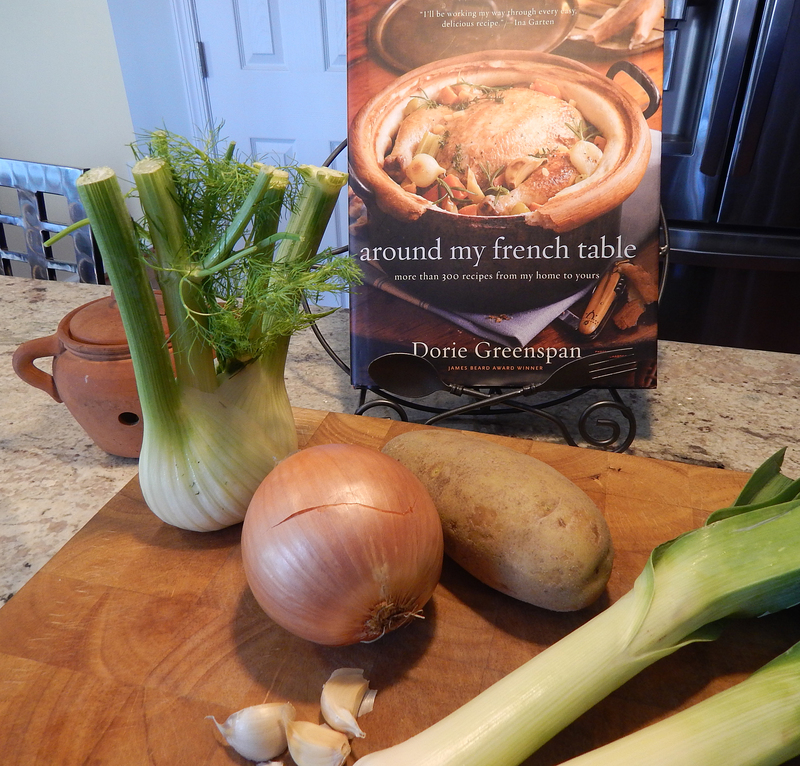 Many of our recipes were inspired from our cookbook Around My French Table by Dorie Greenspan. The recipes in Greenspan’s book might be from a French table — and we do love reading her stories of learning new dishes and encounters with the butchers and cheese mongers of Paris — but the recipes are also perfect for anywhere that you have access to really good, fresh produce. And you can’t get much more French than Leek and Potato Soup. 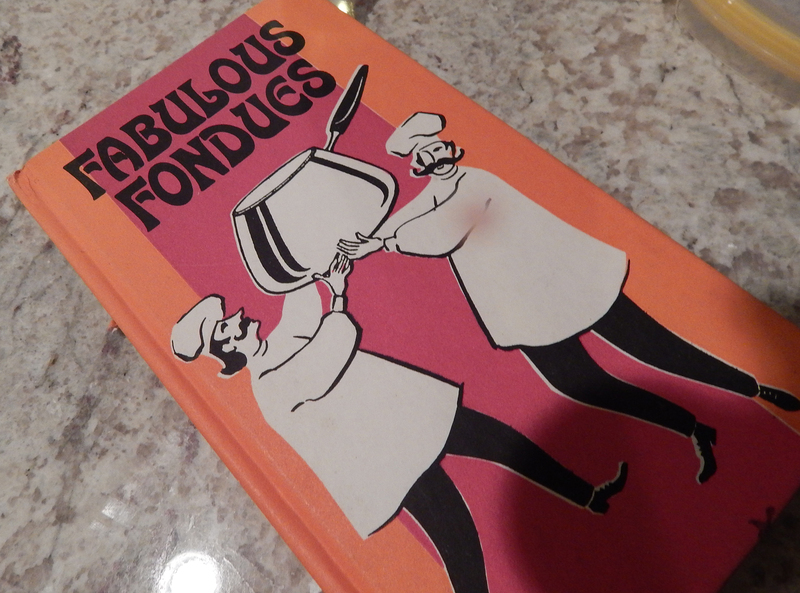 A throw back to the ’70’s: cheese fondue. 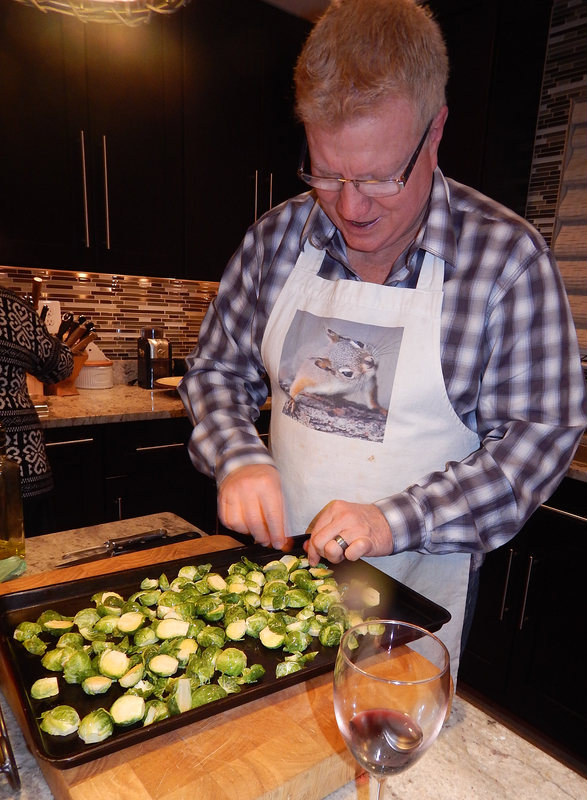 Russ getting ready to roast the brussels sprouts for fondue dipping. 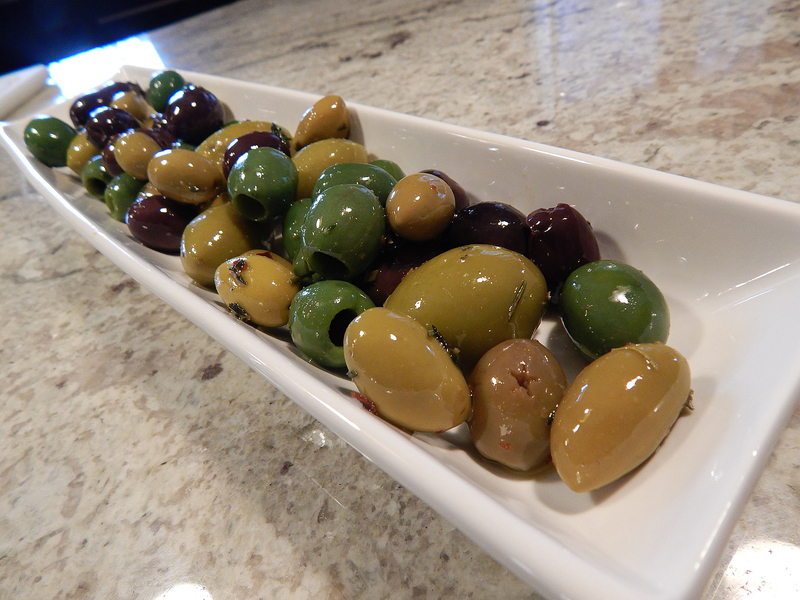 Olives marinated in spiced olive oil for a week. Herbed Olives, are lovely just a few hours after making them but most definitely improve with age – the next day and even more so several days later, the flavors intensify, so we spiced ours a full week ahead of time. We love the idea of using the oil for dressing salads, tossing with pasta or drizzling over meat once all the olives are gone. A unique cooked endive salad. 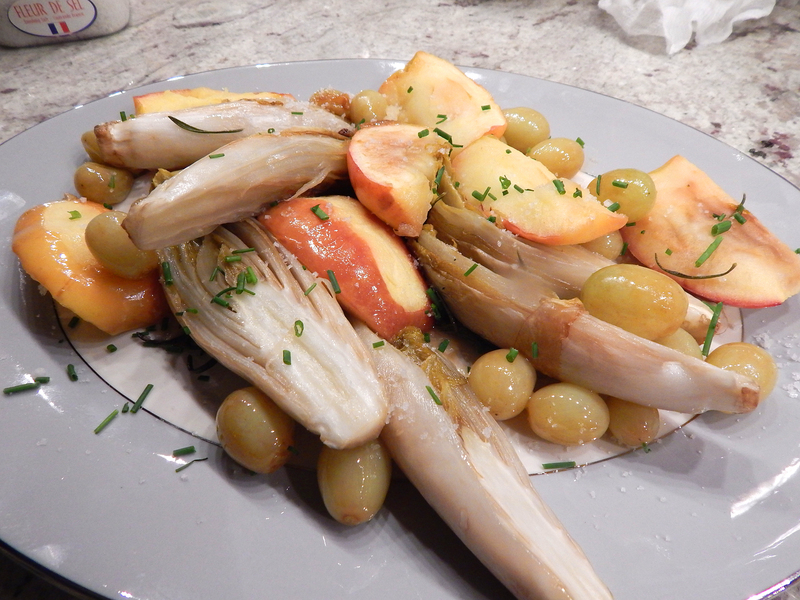 In the salad recipe, we cooked the endive, apples and grapes in a skillet, turning the ingredients only once, so that the slow-cooked endives and fruits take on a burnished, caramel-colored finish. In general, France’s salted butter is saltier than ours in the States, so you’ll need to taste the little bit of pan sauce before serving to decide if you want to salt the dish a little more. You can tell Joe Hagan and Steve Oldham dislike each other immensely 😉 We had to send these two out on a mission to get a baguette loaf for the fondue. 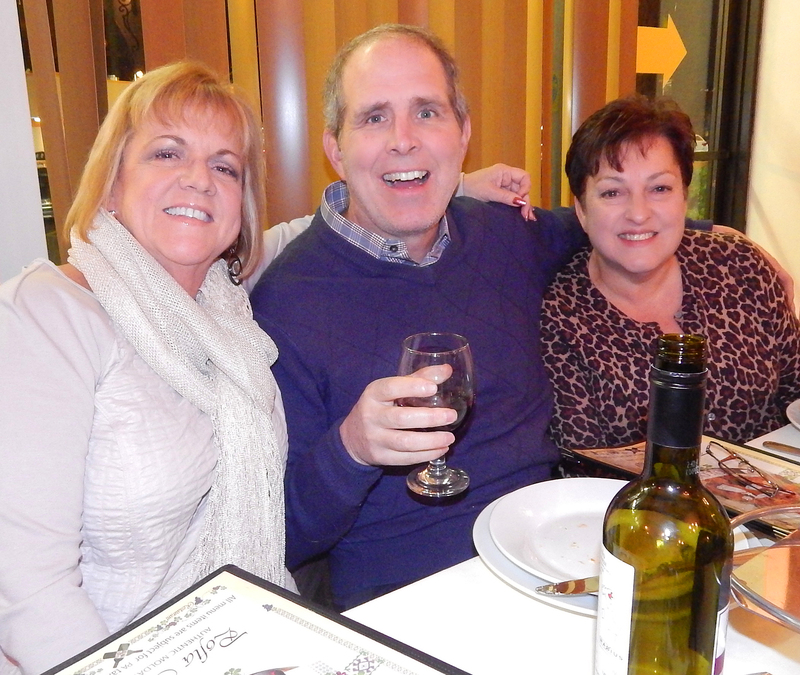 Once everything came together, we enjoyed a leisurely dinner with lots of laughter and fabulous food. Some of the conversation centered around a possible getaway next Fall to celebrate the four out of six of us who will turn the milestone birthday of 60—eegads, how did that happen?? Hmmm, that could be an interesting food blog in itself! Pear Mousse with Chocolate Shavings for dessert. 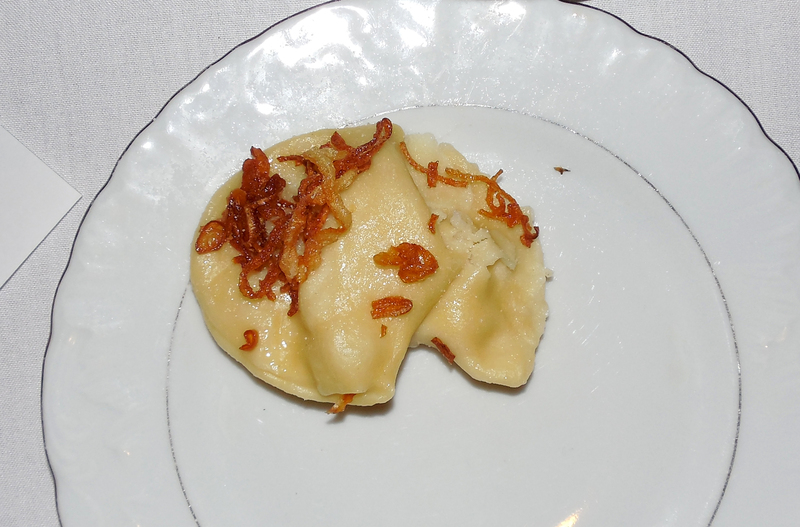 Maria Odilia explained how she got this recipe when attending a French cooking class over 10 years ago. Melt the butter in a Dutch oven or soup pot over low heat. Add the onion and the garlic and stir until they glisten with butter, then season with salt and white pepper, cover, and cook for about 10 minutes, until the onion is soft but not colored. Add the remaining ingredients, along with a little more salt, increase the heat, and bring to a boil. As soon as the soup bubbles, turn the heat to low, mostly cover the pot, and simmer gently for 30-40 minutes, or until all the vegetables are mashably soft. Taste the soup and season generously with salt and white pepper. 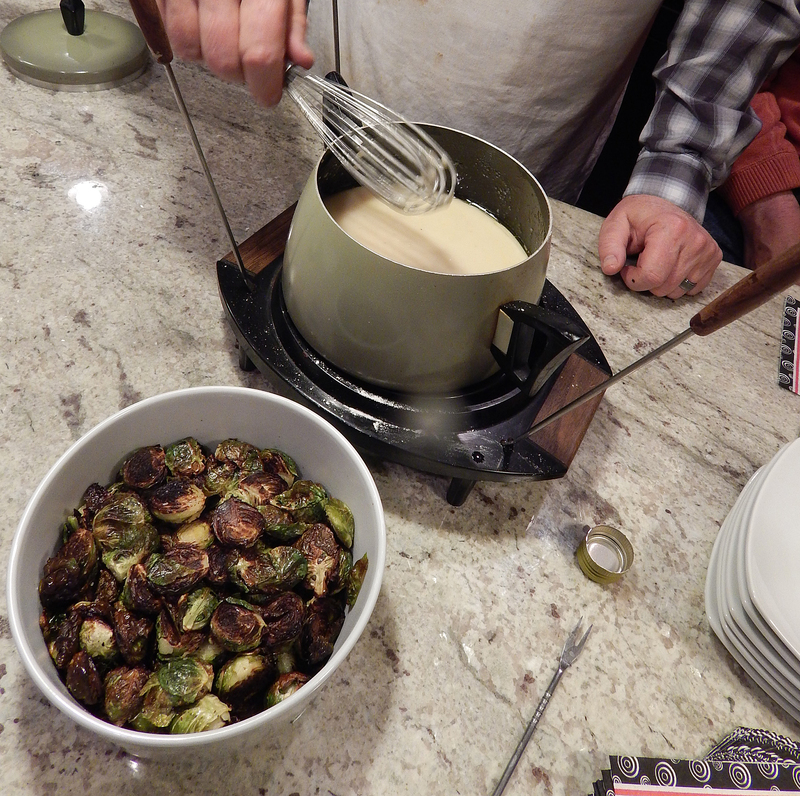 The soup can be pureed at this point in a blender or with an immersion blender, or can be served chunky. It can be served hot or cold. We pureed the soup in a food mill for a silky consistency. Cut the endives lengthwise in half. Cut the apple into quarters and remove the core. Peel off a thin strip of skin down the center of each quarter. Put a large skillet (nonstick is best) over low heat and toss in the butter. When it’s melted, put the endive into the pan cut side down and the apples skin side up. Add the grapes, scatter over the rosemary, and cook, undisturbed, for 20 minutes, at which point the underside of the endives will have caramelized and the apples and grapes will be soft and perhaps browned. 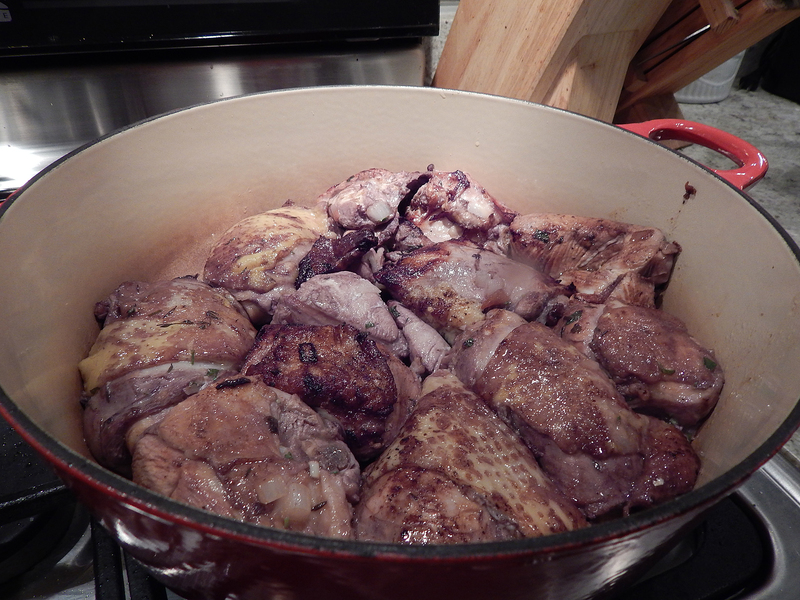 Gently turn everything over, baste with any liquid in the pan, and cook for 20 minutes more. Transfer the ingredients to a warm serving platter or to individual plates and, using a sturdy wooden or silicone spoon, scrape up the cooking sugars sticking to the bottom of the pan. You might want to pour a few spoonfuls of water into the pan to help you nab the sugars and make a spare amount of sauce. Season the endive with salt and pepper, spoon over the jus, and serve. 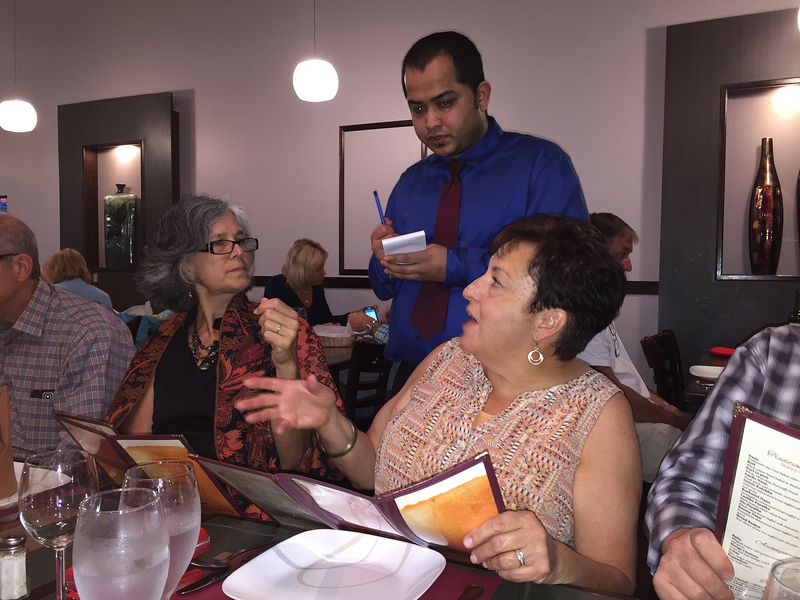 It’s been at least six months since our “Ethnic Dining Group” reconvened for a new dinner experience. 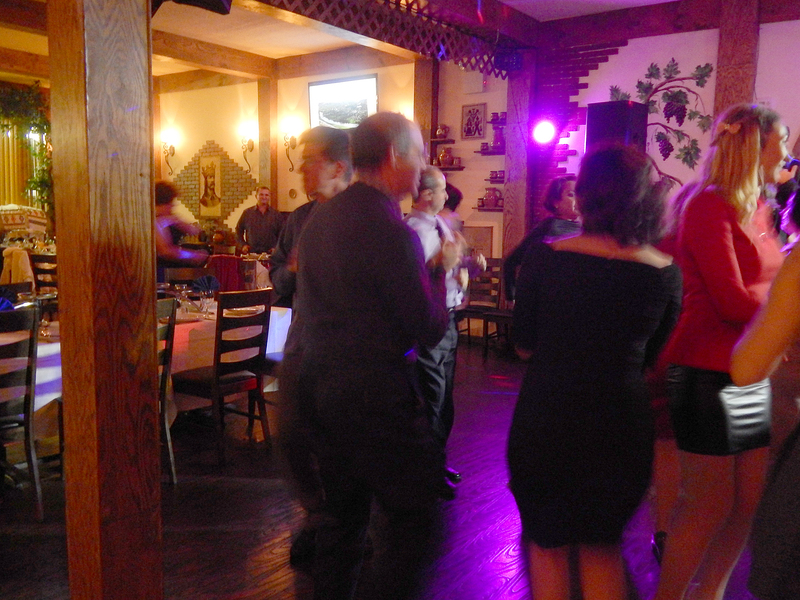 And this time we went to Moldova, a BYOB located on Bustleton Avenue just off the Boulevard in Philadelphia. (The original “mother” restaurant is in Midwood, Brooklyn.) Located in a strip mall, the decor is a bit “kitschy,” the waitstaff wear traditional garb, and most employees speak with a heavy Russian accent. 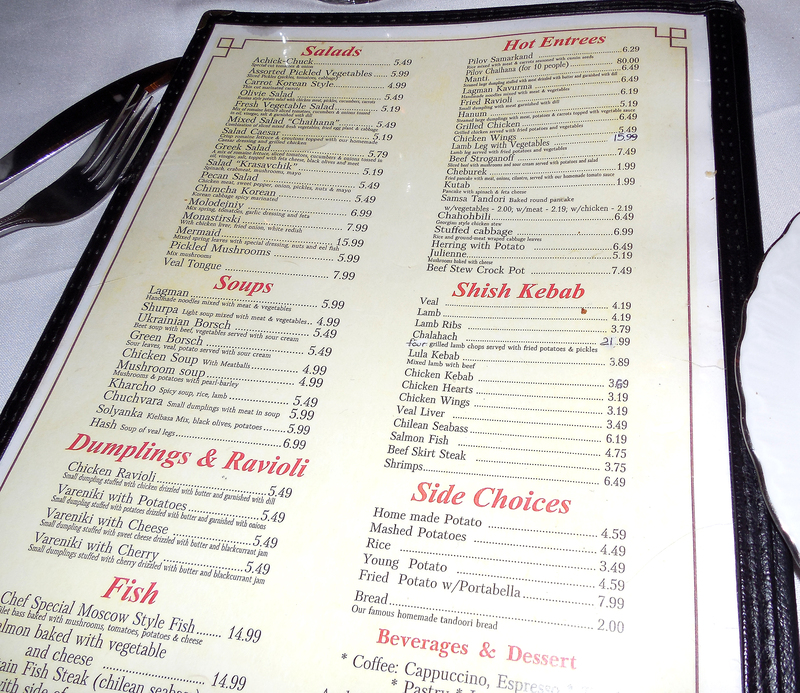 The extensive menu was in English, Russian and Moldovan. Russ, having studied Russian for four years, threw off Maria Oldilia when he started reading it aloud—she thought he was just kidding! 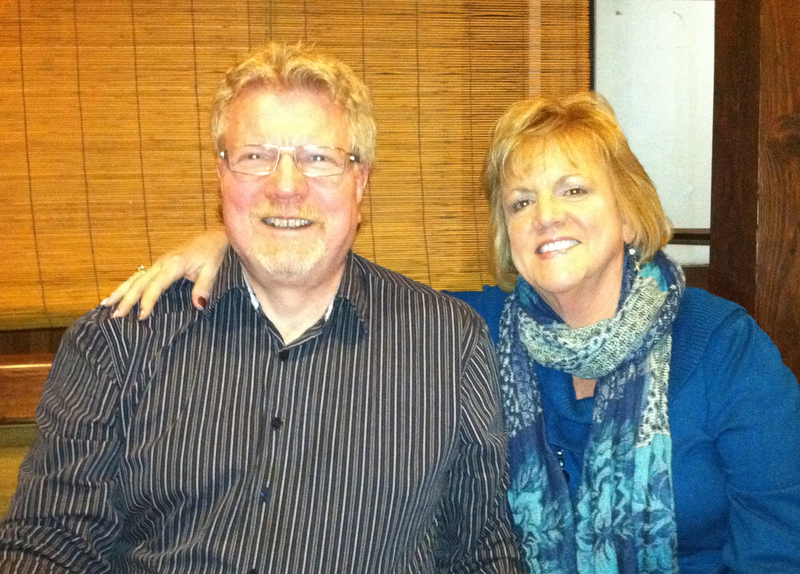 Your’s truly, Steve Oldham and Teresa Hagan. Joe Hagan, Maria Odilia Romeu and Russ Hartman. 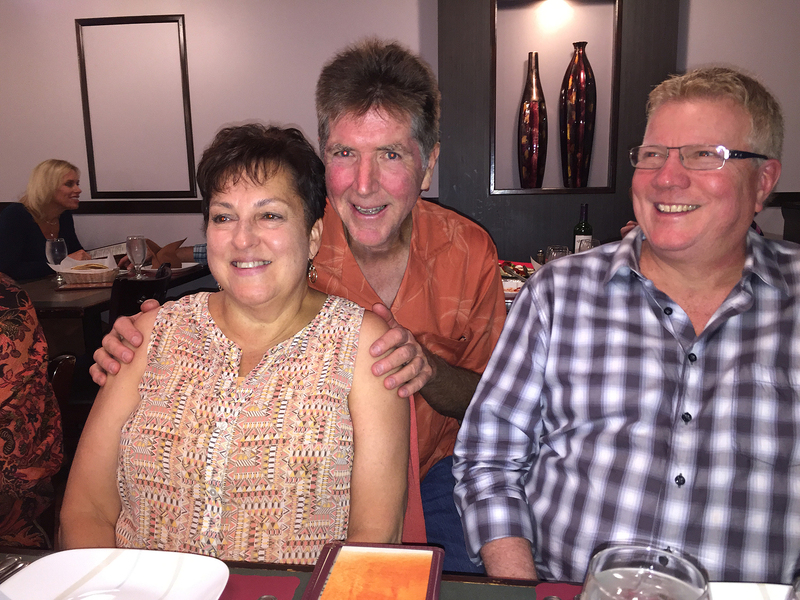 The Hagans were more versed in Moldovan food than the rest of us because they visited their daughter Jeanne Marie when she was stationed over there years ago. 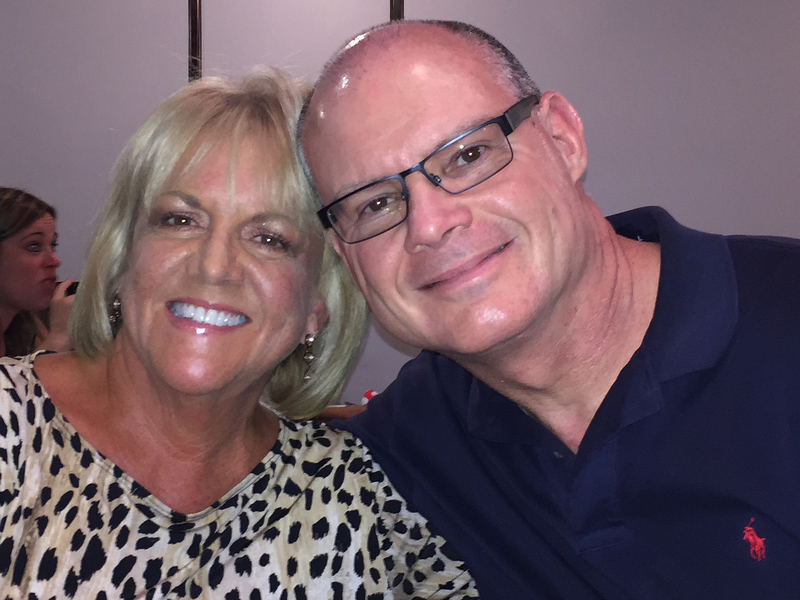 Plus Jeanne has dined at Moldova and coached mom Teresa on what to eat, with a strict admonishment to “not let those Moldovans bully you into ordering full entrees.” So on that note, we were all happy to let the Hagans make the food choices centered around the appetizer list. Entrees are heavy and generous, with the hardest-working dish: mamaliga, a cornmeal porridge, which didn’t sound like an “appetite grabber” in my humble opinion. This bread-porridge hybrid is served with just about anything and appears in almost every non-dessert entree ordered. In our case, it came with deep-fried pork belly and crumbled feta cheese. Was it good? Not according to me! The mamaliga was mealy and the pork belly chewy, not my cup of tea at all. But some of the group must have liked it because it all but disappeared. When we first arrived we noticed several long tables set up for some sort of party so we asked to be seated in a side alcove away from what was sure to be a loud and raucous evening. Sure enough, as the night wore on, the Romanian birthday party, complete with band, singing, and a disco ball (seriously! ), started dancing away. One woman spotted our group and encouraged us to join in the festivities. Keeping in the spirit, both Joe and Steve joined while I snapped some photos. Traditional for the Moldovan cuisine are dishes combining diverse vegetables, such as tomatoes, bell peppers, aubergine, cabbage, beans, onions, garlic, and leek—right up my alley! 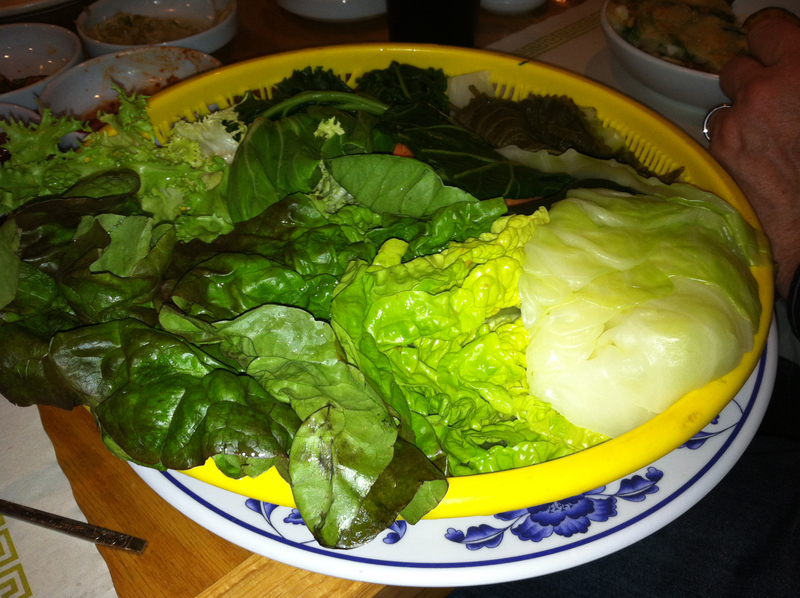 Vegetables are used in salads and sauces, and they are baked, steamed, pickled, salted, or marinated. 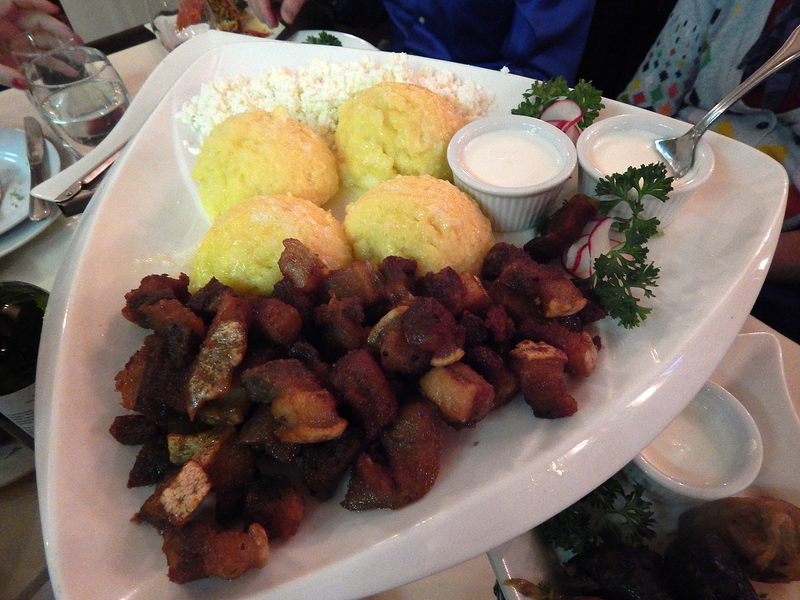 Meat products hold a special place in Moldovan food, especially as an appetizer or the first course. 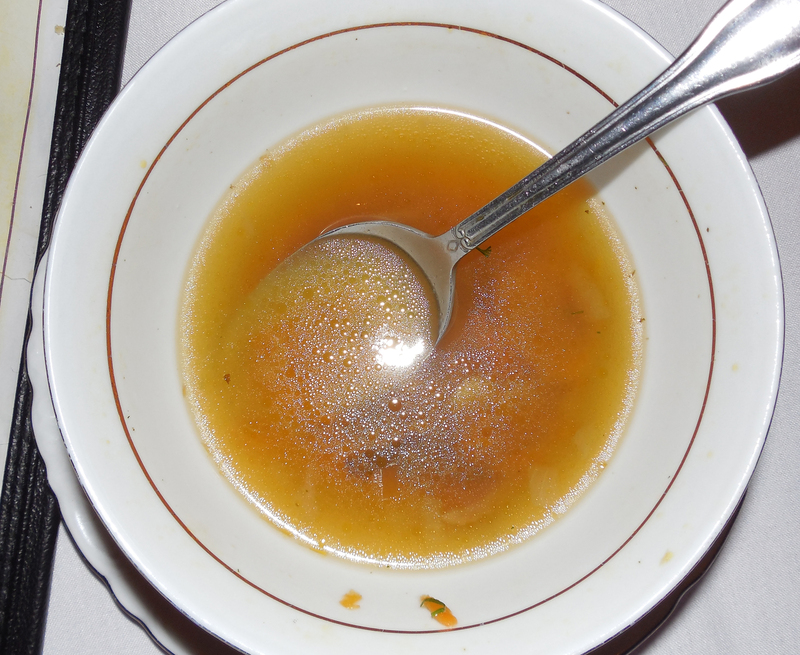 Chicken soup with meat, known as ciorbă is very popular. Roasted and grilled pork, beef meatballs, and steamed lamb are common. Meat and fish are often marinated and then grilled. Non-alcoholic beverages include stewed-fruit compotes and fruit juice. Popular alcoholic beverages are divin (Moldovan brandy), beer, and local wine. 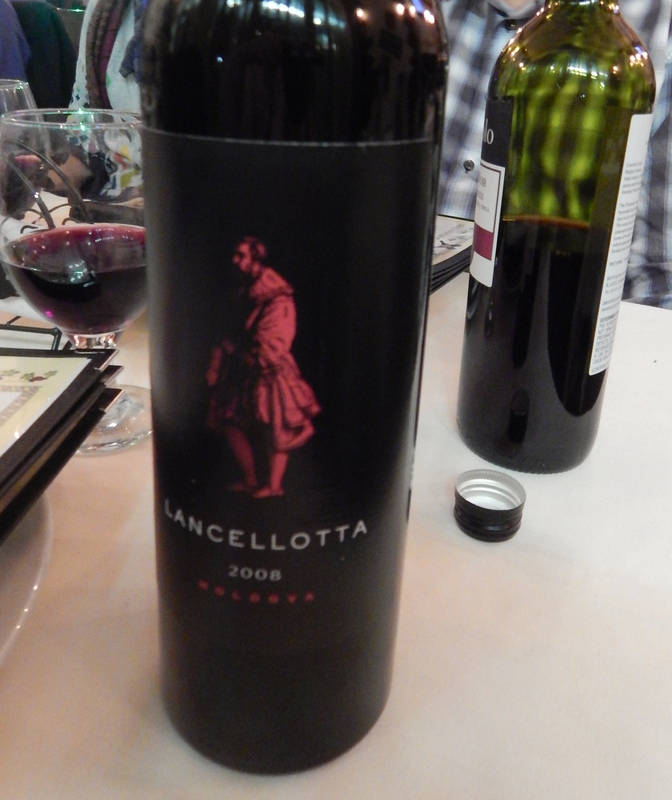 Maria Odilia impressed all of us when she produced a Moldovan red wine, Lancellotta, which was quite good! In the center of our table was a tiered food stand for the plates of appetizers. Of course, we ordered so many that they were also placed around the table—we’re talking space was at a premium here. 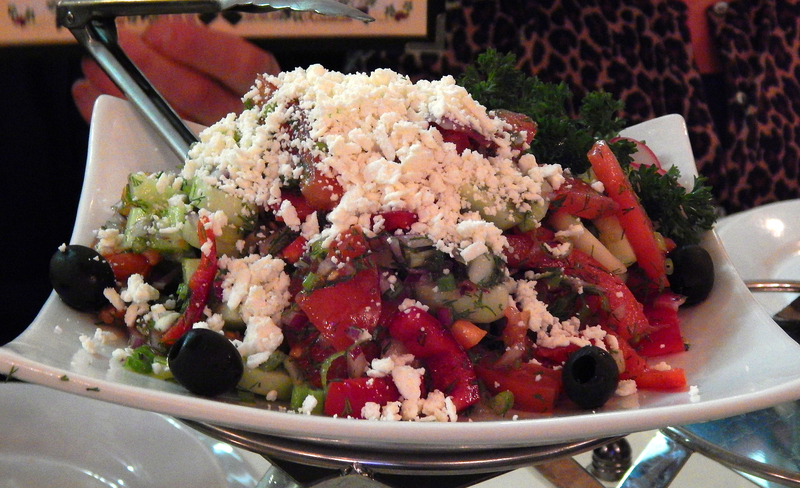 First up, a wonderful salad, Salata Taranesc: tomatoes, cucumbers, peppers and feta cheese with sunflower oil dressing. With a penchant for salad, I had an extra serving. Next came a platter of cheese pastry wedges Placinte, which were very good. 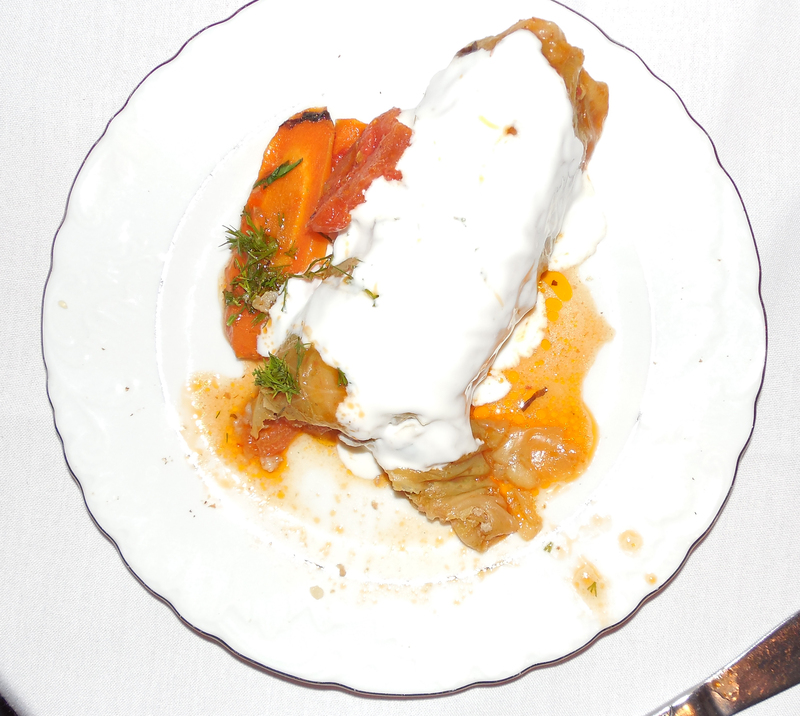 Practically everything came with a side of sour cream and a sprinkle of dill. 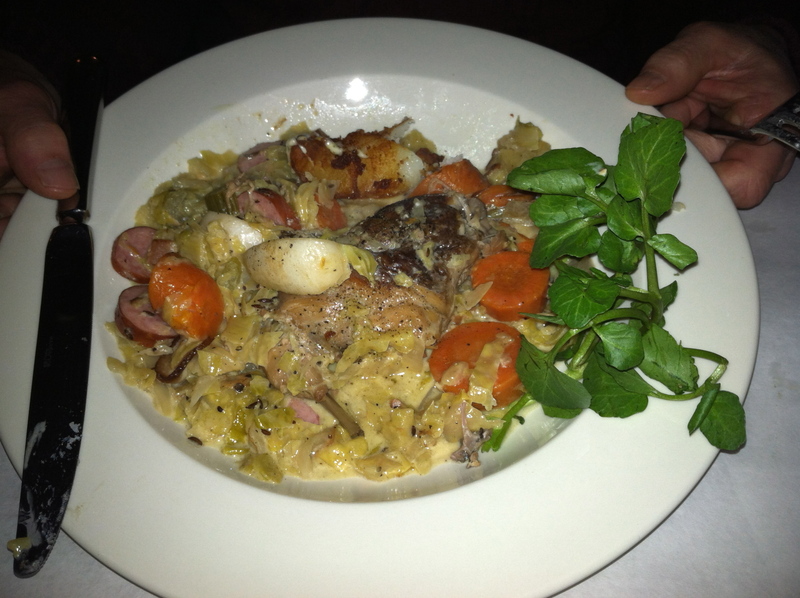 Mititei, grilled traditional kielbasa served with peas and onions—a huge hit! 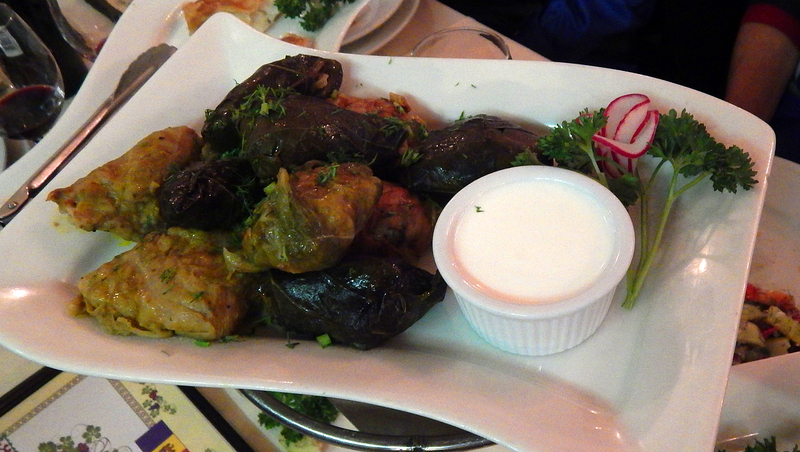 Grape leaves stuffed with rice and meat, Sarmale Ca La Mama, were good but a bit bland. 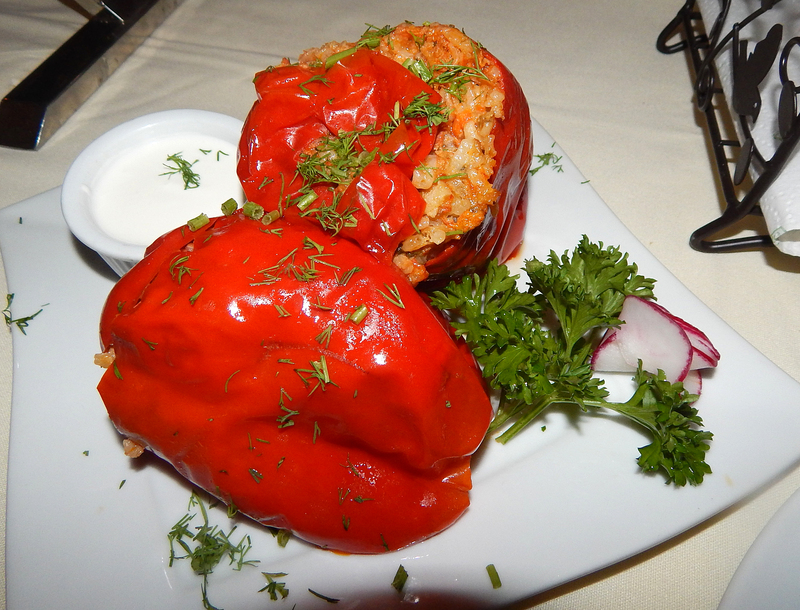 Chiperi Umpluti, red peppers stuffed with rice, vegetables and meat were a winner. Coltunasi, pork dumplings (shown at top of plate) served with sour cream and butter came in a ceramic crock. Our perky Russian waitress agreed to pose for us with the dessert platter. The dessert presentation was exquisite! 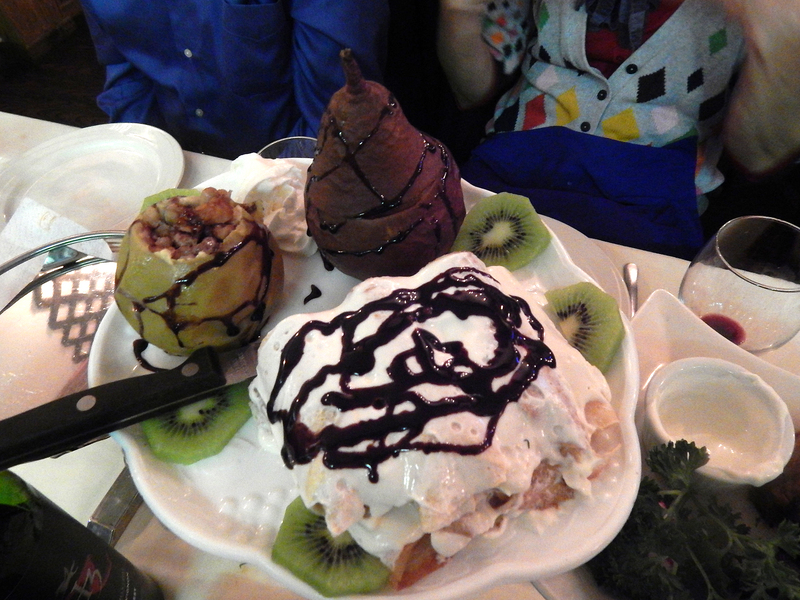 Mere Sau Pere Coapte, a carved out apple and pear were covered in chocolate and stuffed with walnuts and honey. 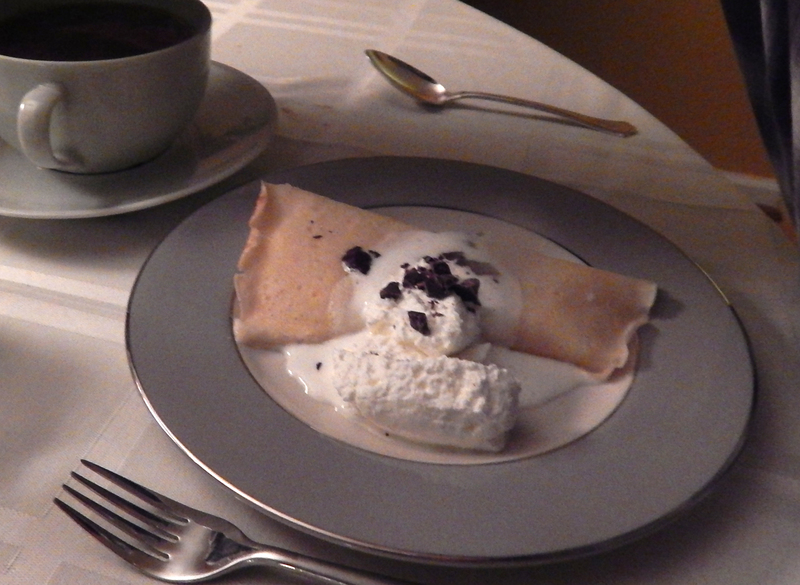 Additionally, a pile of sour cherry-filled crepes, Clatite cu Visine, were topped with whipped cream and drizzled with chocolate, while the entire platter was adorned with slices of fresh kiwi. Since I don’t eat dessert, I had to rely on my companions for their honest opinions. Therefore, Russ who hates walnuts, was not impressed, although he had a taste of the pear and enjoyed that. The others appeared to find it more visually exciting than orally satisfying. 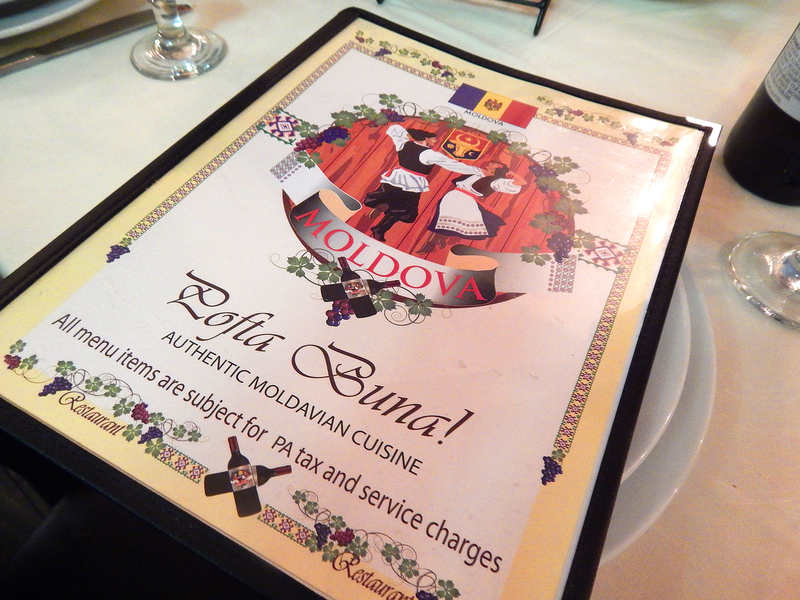 As their website states: In the kitchen at Moldova Restaurant, chefs rely on tradition. Building dishes based on centuries-old recipes, they send out plates of authentic Moldovan cuisine that range from fragrant soups to hot and cold appetizers and a variety of entrees such as costita ribeye steak. The interior, marked by colorful tiles, decorative hung plates, and scenic murals, welcomes diners during lunch and dinner, as well as Sunday brunch, and group banquets. Scale the heights (not the mountain) of culinary satisfaction when you visit Mt. Fuji Hibachi & Asian Bistro, a unique extravaganza of Japanese hospitality in a modern setting with a sultry ambience. The restaurant is conveniently located in Langhorne’s Summit Square Shopping Center at Rt. 413 and the Newtown bypass. Their master chefs will have you wanting for more, and for a return visit, it sure did for us! Interior view of Mt. Fuji. This establishment has a full-service bar, so our dining journey began by selecting a bottle of Tempranillo, only to be told they were out. However, Russ quickly chose a Cabernet and a crisis was avoided. While awaiting the wine, we perused the extensive menu to determine which unusual appetizer to split. 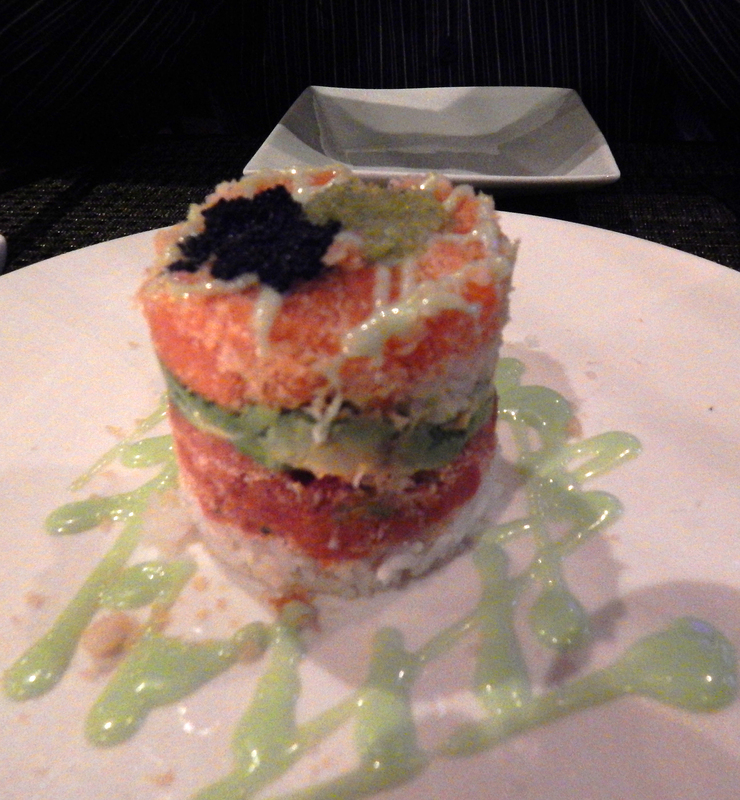 Not to be disappointed, our final decision was the Tuna Salmon Tower, with layers of spicy tuna, spicy salmon, avocado and tobiko with wasabi mayo sauce. Absolutely divine, and could easily be enough as a meal for one person. We only wished they had given us an extra side of the savory wasabi sauce. Miso soup and salad with ginger dressing. 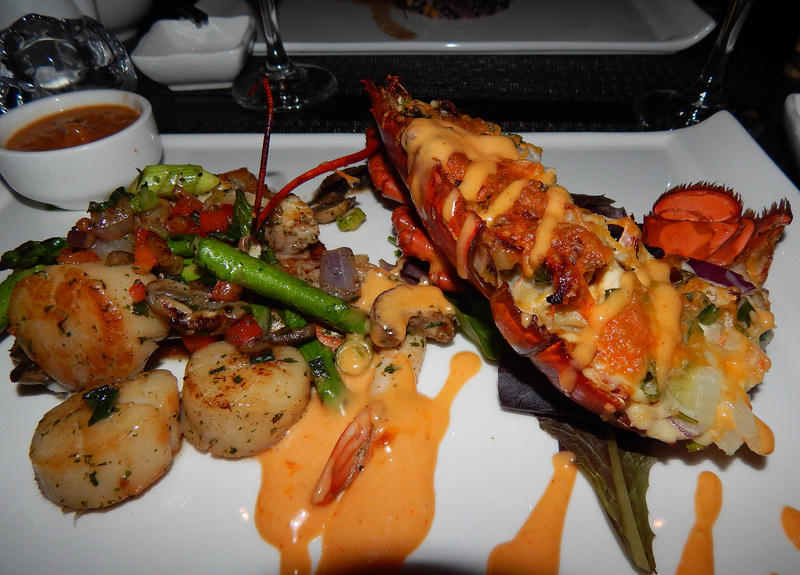 broiled lobster tail, scallops, shrimp and red snapper with lemongrass sauce. They were works of art, and so beautifully plated, not to mention perfectly cooked. Our attentive waiter gave us the option of white or brown rice. 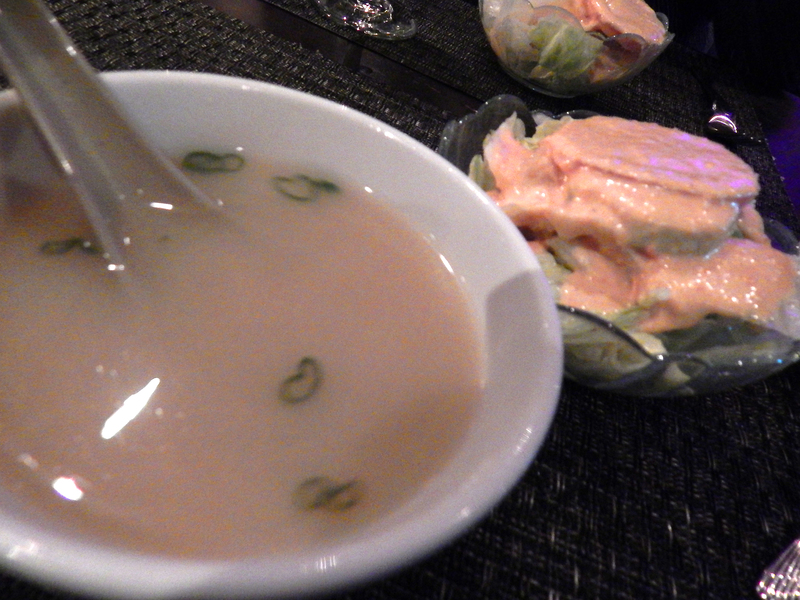 In addition, each dinner came with miso soup and a side salad (loved the ginger dressing) which were both adequate; although the soup could have been hotter, and in my opinion, a bit spicier. Unable to finish even half of my entree, I requested that the waiter please include the lobster shell and shrimp tails as Russ wanted to add them to his collection to make a future fish stock. When it was brought back to the table, he had been kind enough to separate the shells from the edible portion into two separate containers. An assortment of other options are also available including sushi, sashimi, teriyaki, tempura, pad thai, udon noodles, bento box and an array of hibachi dinners. I have read reviews about this restaurant that are all over the place, noting poor service, awful food and long waits. 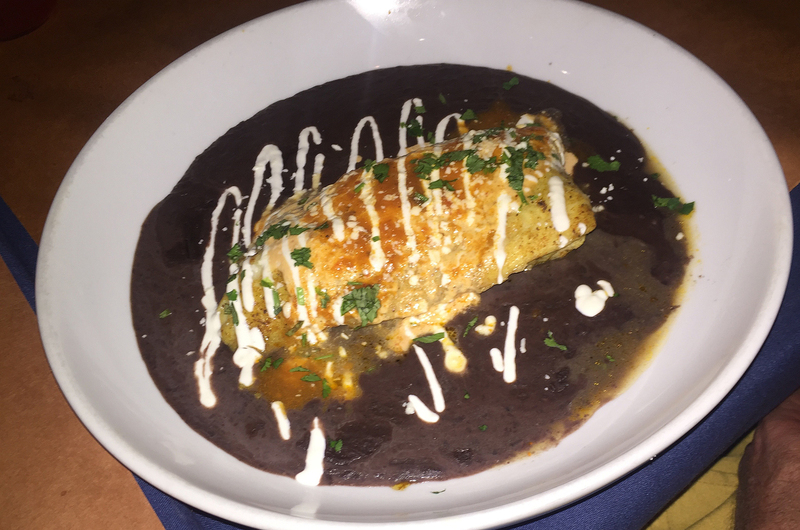 But from our recent experience, we have nothing but rave reviews for the staff and the food. We will definitely make a trek back to Mt. Fuji! A couple of months later we dined at Aroi in Southampton, and unbeknownst to us, a sister restaurant to Mt. Fuji. 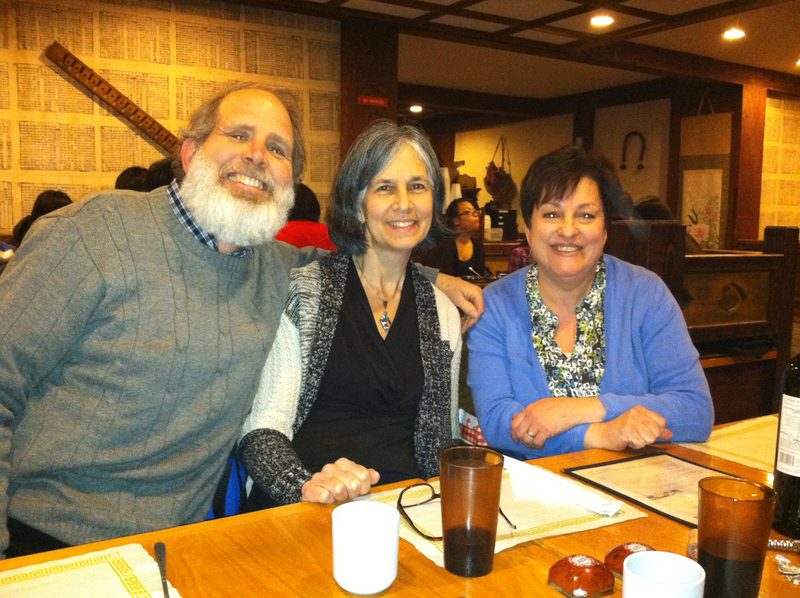 As Titan, the umpteenth Winter storm was supposedly bearing down on us, (we ended up only getting about an inch this time), “The Ethnic Dining Group” joined up at Jong Ka Jib Soft Tofu, a Korean restaurant on North 5th Street in Philadelphia. 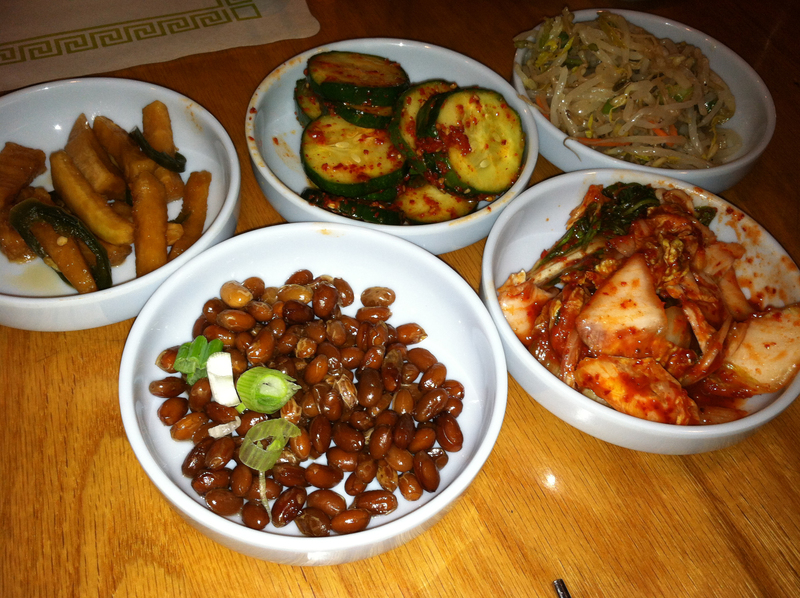 The majority of the patrons looked of Korean descent, which was an indication that the food was going to be authentic. Outside, there was a generous parking lot, which we were concerned about given its location, and although the exterior facade was not too inviting, we were pleasantly surprised over the decidedly Asian and serene ambiance of the interior spaces. A portion of the Soft Tofu menu. 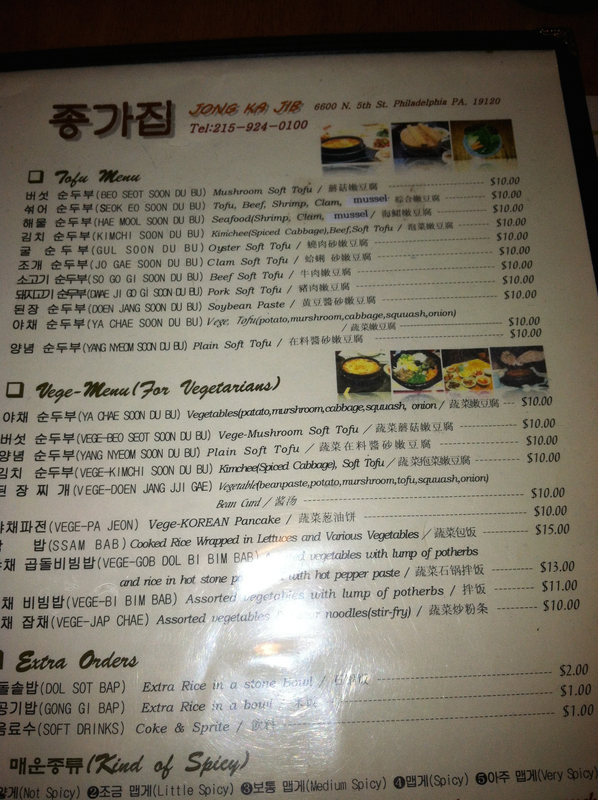 Be forewarned, the service may not be the best if you are non-Korean, which is what we encountered. Our waiter was difficult to understand and he couldn’t satisfactorily answer our questions, and being that we weren’t sure what was what, we just winged it and chose an assortment from the appetizer menu to get started. 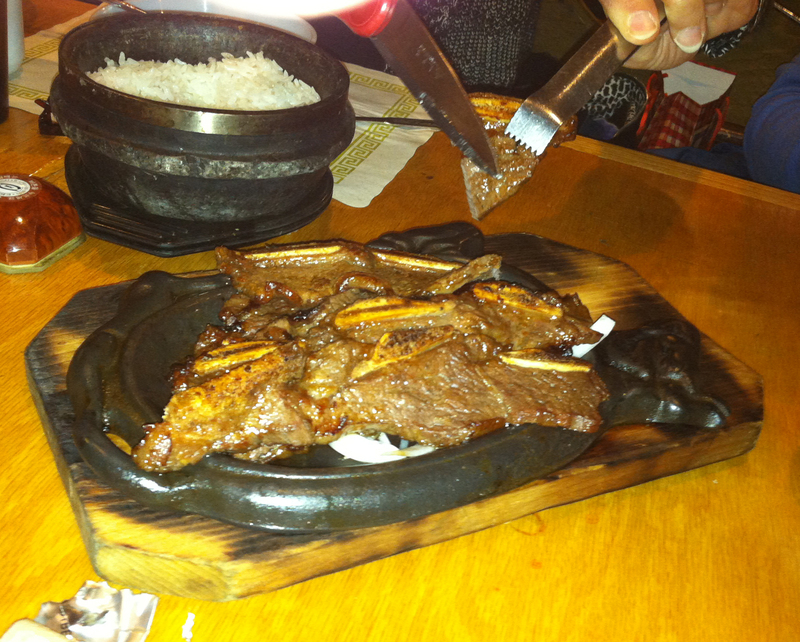 Our order consisted of: Pa Jeon a delicious Korean pancake, which we absolutely loved; Ssam Bab cooked rice wrapped in lettuces and various vegetables; Korean BBQ Ribs Beef; and BBQ Pork Ribs — our least favorite item due to the way they were cut with mostly bone and very little meat. Spiced and pickled vegetables for the lettuce wraps. Unbeknownst to us (because our waiter did not communicate this little fact), we were served several bowls of sauces, spiced vegetables and beans, and three large lava rocks full of steaming rice, all of which was supposed to go into a selection of steamed greens. However the steamed greens came nearly 20 minutes after the spiced vegetables, which by then were more than 50 percent eaten! It made for a good laugh though and we channeled our attentions to what was coming. Some other interesting aspects were the “flatware” consisting of a large soup spoon and two flat metal chopsticks, with no forks or knives in sight. Now I am one of those people who just cannot get the hang of using chopsticks, so I speared the veggies and spooned the sauces, and used lots of napkins because we ate the lettuce wraps with our hands. And being a BYOB, you’d think they’d have wine glasses, right? Nada. Upon asking for our wine bottles to be opened and wine glasses for all, we were thrown a cork screw and given plastic water glasses! OK, so top-of-the-line service was not their forte. Slicing into the beef ribs. Apparently, for the spice level, it goes from levels 1 through 5, with levels 4 and 5 supposedly being very spicy. But since we were never asked about a spice level, it may be that it only applies to full entrees (or that we weren’t Korean?) After the evening was over, I found out that this restaurant’s featured dishes are the Soon Du Bu, a variety of Soft Tofu dishes, and thus their name. Guess we’ll just have to go back and try them! Teresa and Joe Hagan, notice the cork screw and plastic glasses! Oh, and the prices are very reasonable. We each spent $30 per couple which included a more than generous tip. But had we each ordered a full entree with the appetizers, the cost could be near double that. Momento from Maria Odilia as a reminder of our Scandinavian restaurant excursion. At the onset, Maria Odilia gave each couple a very thoughtful momento to remind us of our Scandinavian dining experience at Noor Eet Cafe. 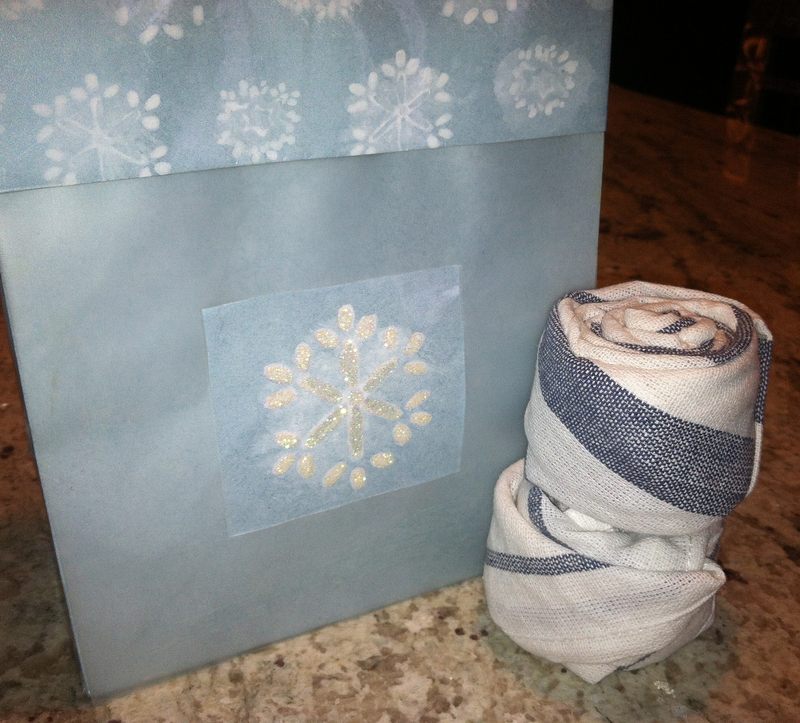 She handmade – and folded — four dinner napkins in the style used at the restaurant… What an unexpected and considerate gesture, Thanks! A fabulous little restaurant at 11th and Tasker, the Noord Eet Cafe serves traditional Scandinavian cuisine. And since our dining friend, Maria Odilia Romeu is half Dutch, we thought it would be a great fit for our next venture into the realm of ethnic dining. While it’s not really conducive to sharing everything family style, this BYOB nevertheless, was a new and fun dining experience. Maria Odilia was able to strike up a conversation with Joncarl (chef/owner) who guided us on what to order. The day before our reservation Philly received around 8 inches of snow and we knew the parking options would be limited. Luckily we found out they have valet parking at the fountain at the junction of Passyunk, 11th and Tasker. And for only $8, it was well worth it. Once inside, we found the space itself was cozy/comfortable with its many windows looking onto Passyunk Square. Additionally, we enjoyed the open kitchen which allows diners to witness the behind-the-scenes while allowing Joncarl to engage and entertain his patrons. There were a few things on the appetizer menu that could be shared, so we ordered the Bitterballen… (fried pork meatballs), nutmeg, mustard, salad; and the Smorrebrod… house smoked fish & open faced sandwich board, which changes daily. A selection of bread options accompanied this plate and the house charred rye bread with butter and garlic was meaty and oh so scrumptious. Personally, while I did like the meatballs, the smoked salmon on the board appetizer was by far my favorite, and dare I say, the best I’ve ever tasted with a subutle smokiness and freshness. 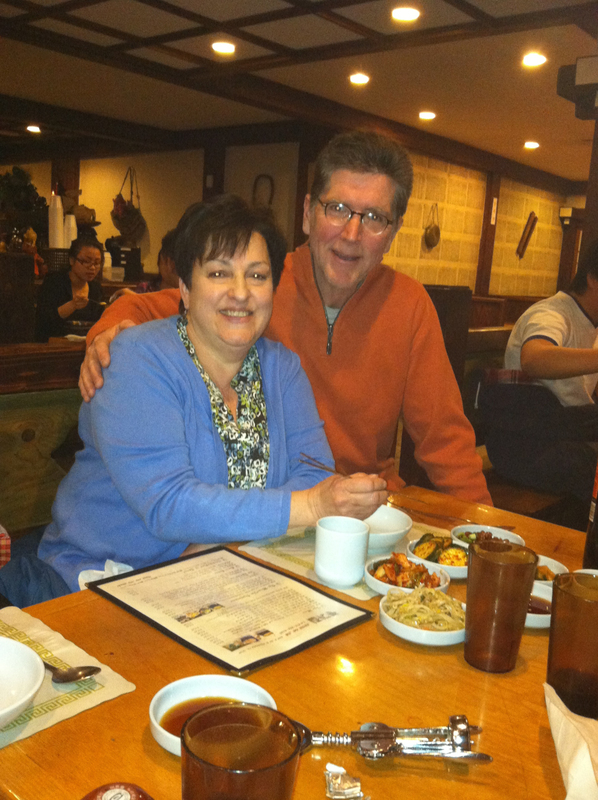 Both Lynn and Russ ordered the pork shank and were completely blown away with the flavors! 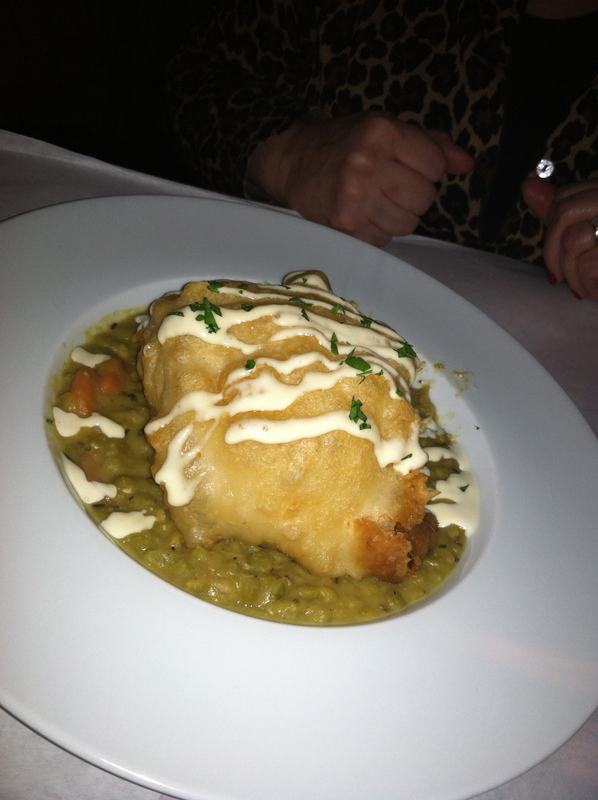 The haddock on split pea was ordered by Teresa Hagan. 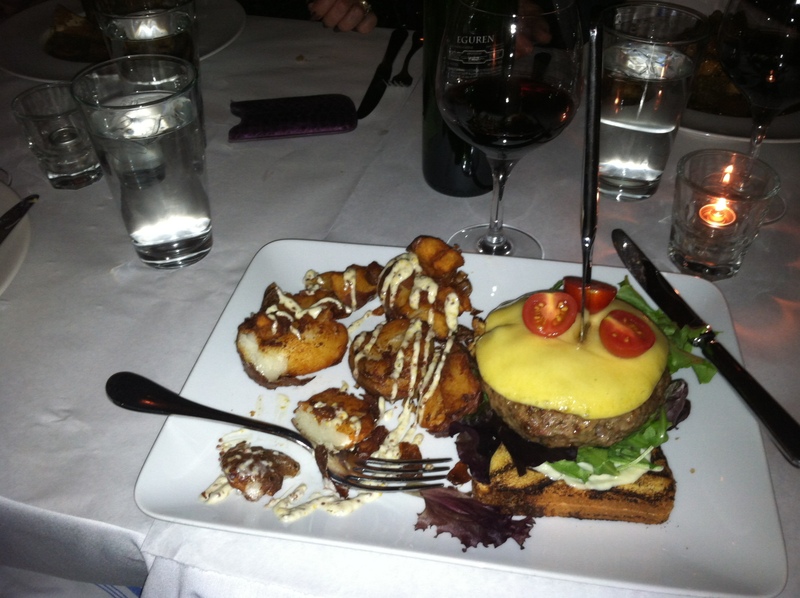 Maria Odilia got the lamb burger and house potatoes which was enough for several meals! An adventurous option, Steve ordered the rabbit leg confit. We will definitely go back. The setting, the food and the service was top class. Our fate was sealed! 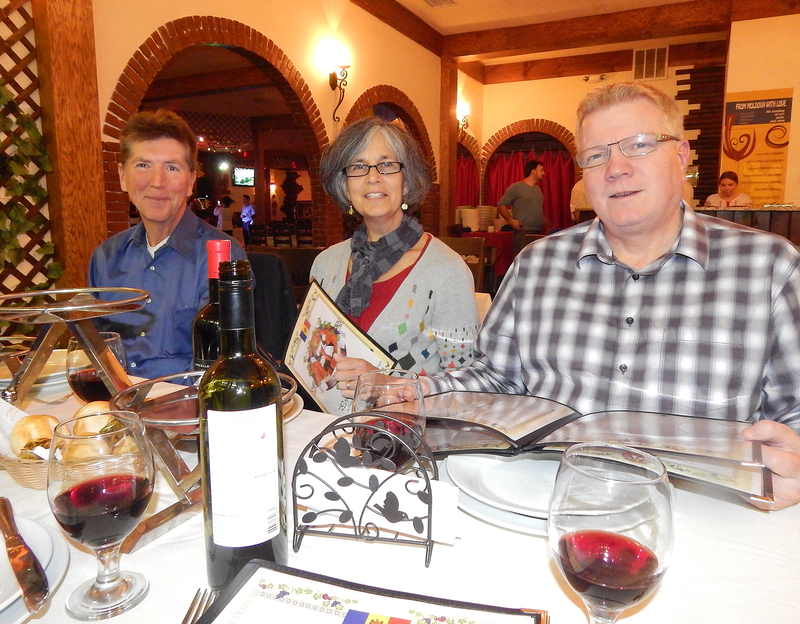 We enjoyed our first cultural dinner at Uzbekistan in Northeast Philly back in March so much that “The Ethnic Dining Group” looked forward to experiencing many more foodie adventures. So in August, we dined at KooZeeDoo on North Second St. in Philadelphia where they serve family-style portions meant to be shared. No particular reason that we chose this establishment, we just happened to come across a very positive Craig LaBan review in the Philadelphia Inquirer. KOO ZEE DOO is a BYOB in Northern Liberties inspired by the cuisine and flavors of Portugal. The phonetic name not only refers to the general adjective “cooked” but also to a traditional Portuguese dish, Cozido á Portuguesa. This dish, a boiled dinner with a variety of meats, including smoked sausages and vegetables, has numerous regional variations throughout Portugal and its former colonies. 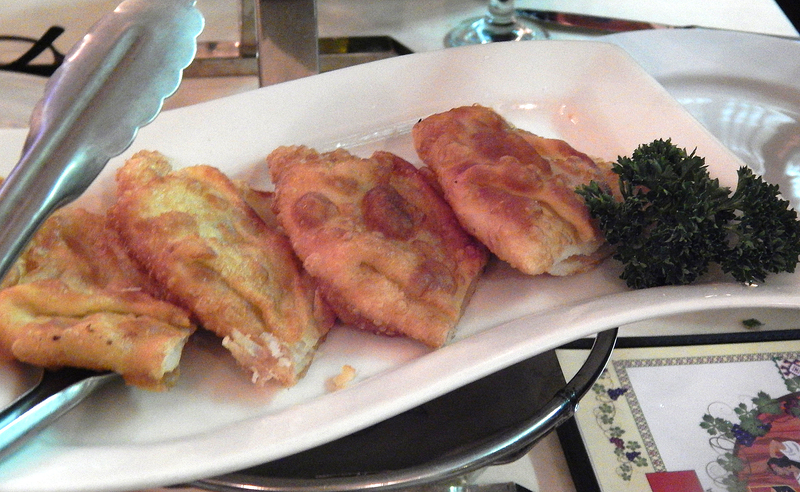 If there is one thing that typifies traditional Portuguese food, however, it is fish. By far the most popular fish in Portugal is bacalhau, dried salt cod. It is even said that there are at least 365 ways to prepare bacalhau, one for each day of the year. A close runner up is the sardine. Portuguese sardines are said to be the sweetest and fattest in the world. 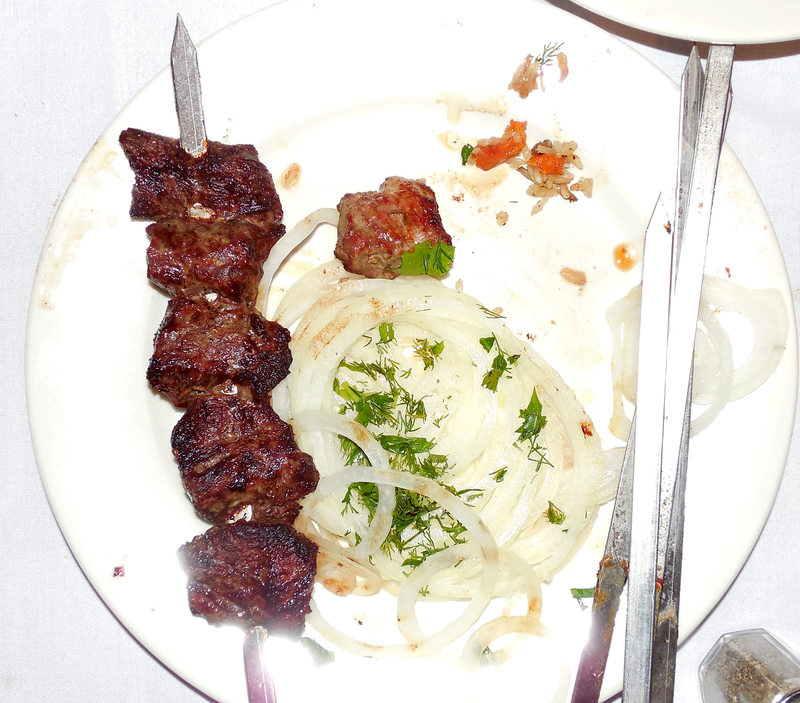 Another popular aspect to Portuguese cuisine is the churrasco or charcoal grill. Frango de churrasco, a young chicken grilled in a rotisserie basket and basted with a briny and slightly spicy piri-piri sauce, is arguably the best way to eat chicken. The Portuguese love the full spectrum of meat as well and believe in using the whole animal. From espetadas (kebabs) to hearty chanfana (lamb or goat stew), meat is prepared in a variety of ways usually paired with a simple salad, rice or potatoes. Bread is eaten with every meal in Portugal. Breakfast usually consists of toast and coffee. While for lunch and dinner, bread is not only used to soak up sauces and broths but sometimes it even serves as a plate. Broa, a crusty peasant corn bread, is unique to Portugal and is, for the most part, interchangeable with rustic wheat rolls at the table. 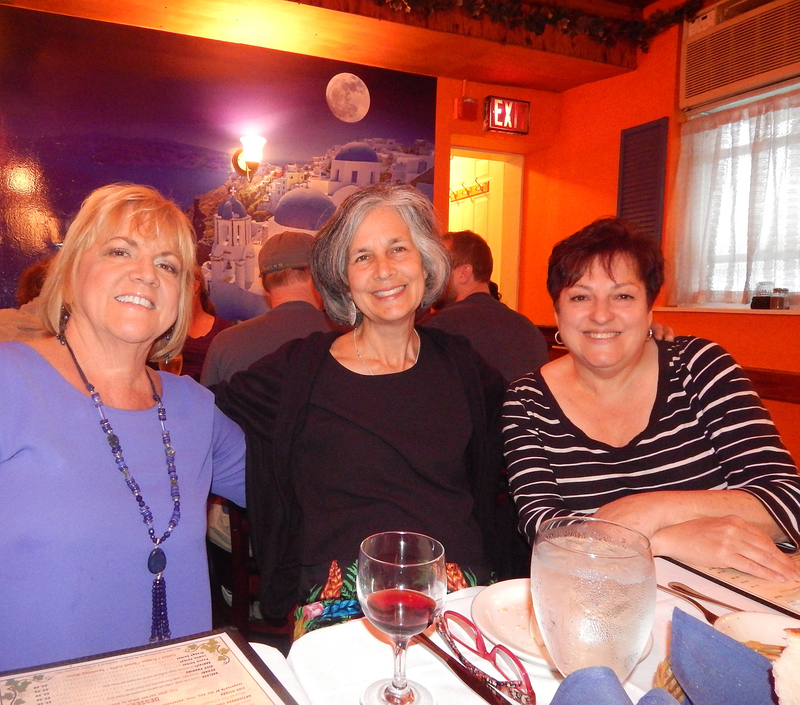 Lynn Holl, Teresa Hagan and Maria Odilia Romeu at KooZeeDoo. 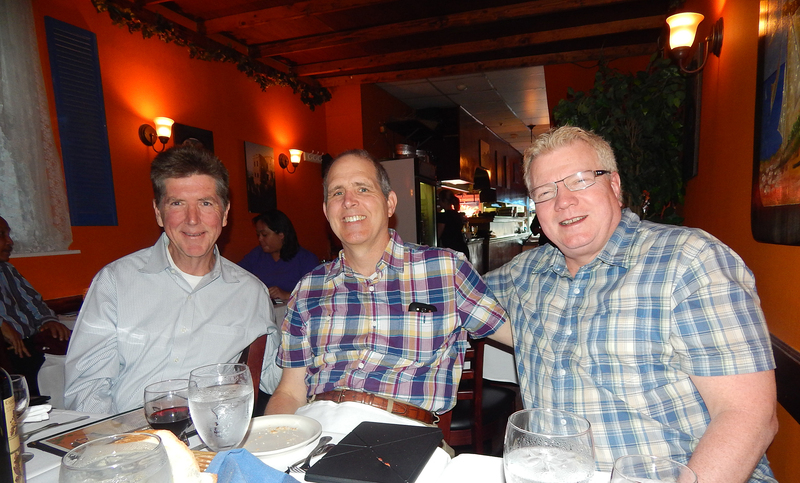 Steve Oldham, Joe Hagan and Russ Hartman enjoying themselves and anxiously waiting for their Portuguese fare. 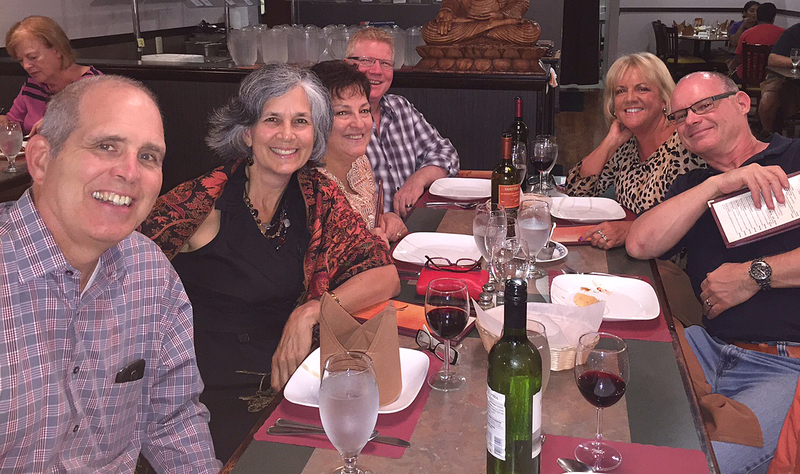 Our third ethnic dinner outing in October was at Angkor, a Cambodian restaurant on Whittaker Ave. 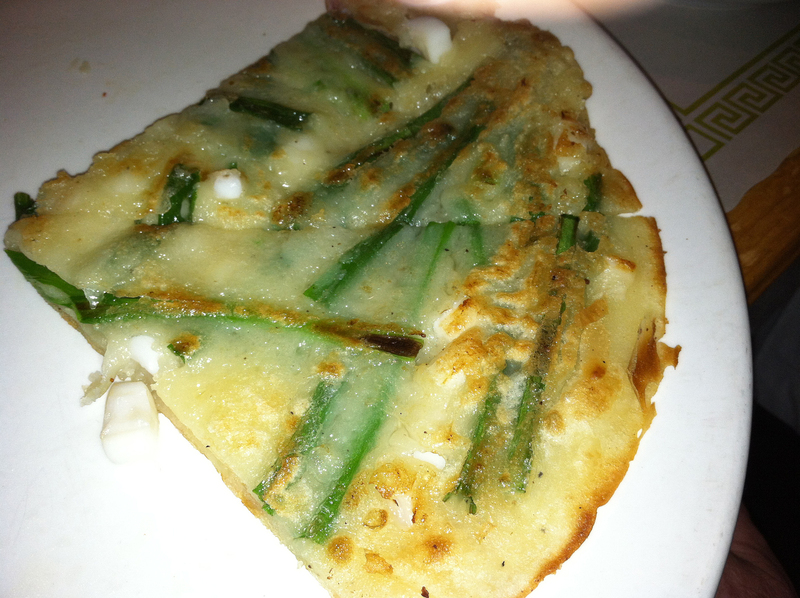 Some of the influences on preparing Cambodian cuisine stem from Chinese, Vietnamese, and Thai roots. These techniques consist of marinating, stir-frying, steaming, and slow cooking. It was established in the summer of 2012 and the food is served individually or family style, which is how we preferred to dine that evening. Their head chef, Kimhuor Tieng, a Cambodian native, started cooking over 30 years ago with the passion of bringing joy and satisfaction to the taste buds of those that experience her food. Cambodian cuisine originates its complex flavors and textures from a variety of spices and aromatic herbs by a blending process called “kroeung” which include some ingredients such as lemongrass, lime, star anise, cloves, cinnamon, garlic, ginger, shallots, cilantro, cardamom, nutmeg, turmeric, curry, and kaffir lime leaves. They use only the freshest ingredients to bring out the perfect delicate balance between saltiness, sweetness, sourness, and bitterness. One of the most distinctive Cambodian ingredients is called prahok, a fermented fish paste found in many of the authentic dishes like the famous “Pleah Sach Ko” (Raw beef salad). Join us again in the near future when I blog about our foray into the world of Scandinavian cuisine at Noord Eet Café. 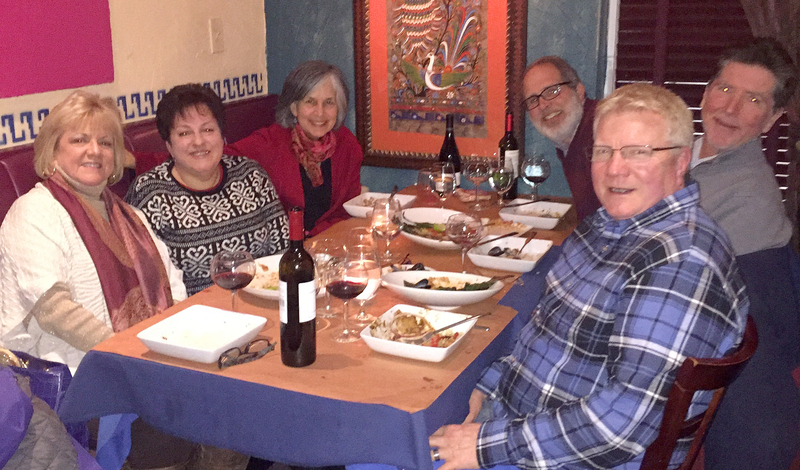 It was the Spring of 2013, when we, along with 2 other close couples, instituted a plan to meet up every 2 or 3 months at a new ethnic restaurant and share the various dishes, not only to broaden our palettes, but to enjoy the camaraderie. One of the criteria was that none of us (or at least the majority) had ever patronized the place before. 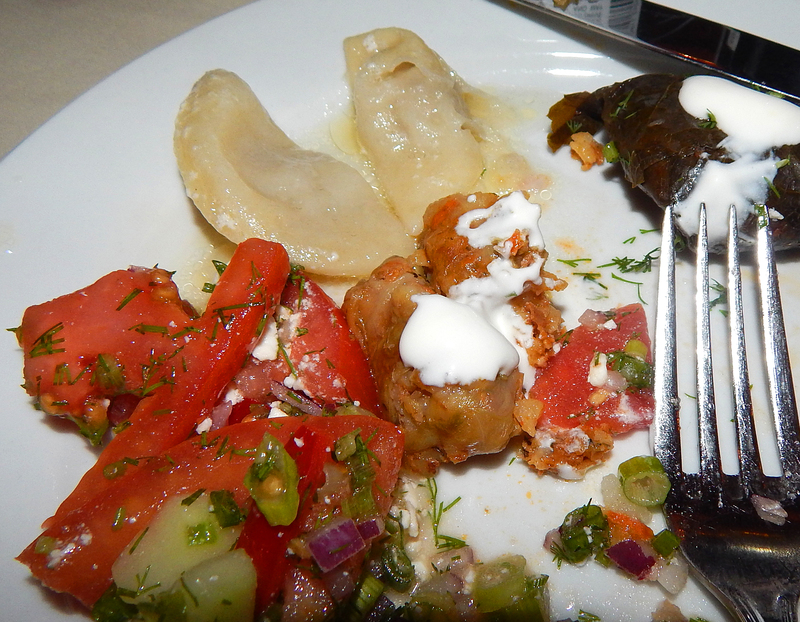 After everyone enjoyed borscht or another soup, we split several appetizers and entrees, rotating them around our circular table to ensure each one of us got to sample all of the delicious offerings. Maria Odilia Romeu, left, and her husband Steve Oldham, center, seated next to Joe Hagan. Mushroom Soup — mushrooms & potatoes with pearl-barley. Stuffed Cabbage — rice and ground-meat wrapped cabbage leaves. 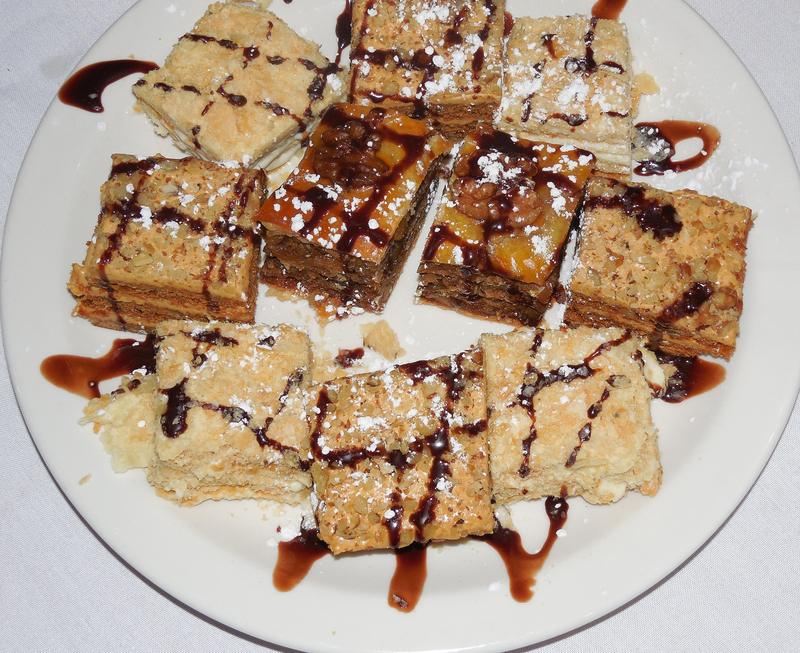 For dessert the group shared a plate of baklava and honey cake. 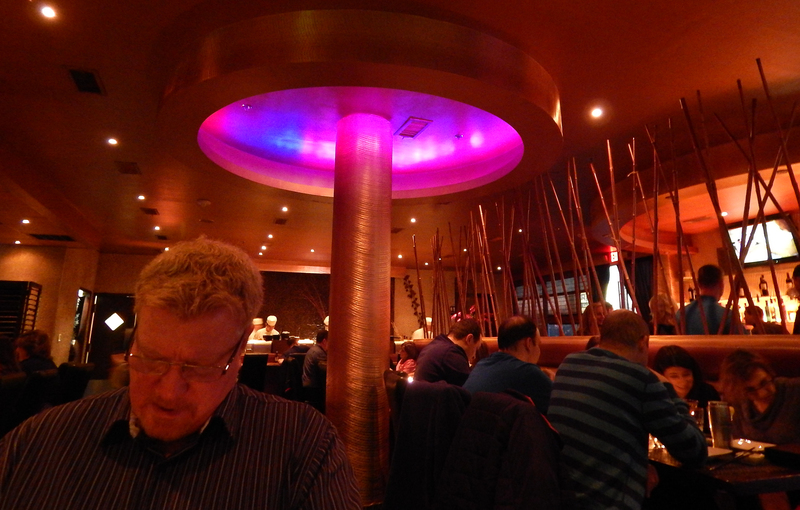 Their menu was extensive and very reasonably priced. 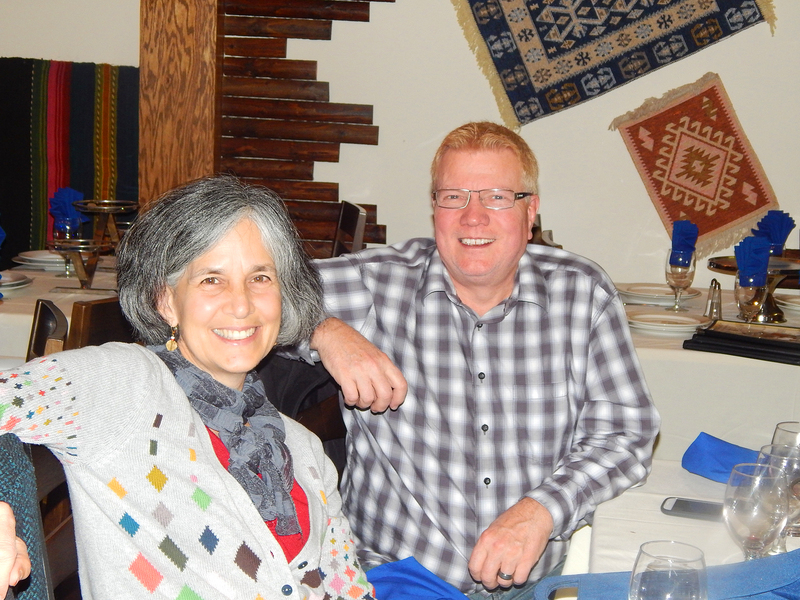 It was unanimous, we would all be sure to revisit Uzbekistan and recommend to others.